Open the accordion sliders below. Learn about successful projects from our customers who worked with MAK. See how MAK products fit into the components and how the components are arranged into systems by our customers. Below are systems that our customers have deployed using various configurations of our products to meet their projects' needs. Phantom Works, the advanced research and development unit for Boeing, has purchased a MAK One Enterprise license for VR-Vantage IG. MAK One licensing can be configured to suit an organization's size, shape, and preferred licensing model. Phantom Works is taking advantage of MAK One to license VR-Vantage IG for use inside reconfigurable cockpit simulators in five separate sites worldwide. Phantom Works is the latest in a surge of customers who are taking advantage of the new improvements in VR-Vantage IG to meet their visualization needs at a lower cost than a typical high-end image generator. VR-Vantage IG provides Phantom Works with a unique set of image generation capabilities. MAK’s VR-Vantage IG software is used to render out-the-window scenes for first-person simulators. Its open-architecture was designed from the ground up to offer the most flexible, high-performance visualization tools on the market. VR-Vantage IG can procedurally generate terrain directly from source data including elevation, imagery, land use classification, and features. It also allows for procedural generation of textures from land use data, which provides higher effective resolution and eliminates artifacts such as baked-in shadows, cars, and trees. Textures for each land-use classification can change based on season and location. VR-Vantage IG can auto-material classify global terrains based on land-use data and feature data to enable accurate infrared sensor views. VR-Vantage IG is capable of procedural generation of airports from X-Plane/ Digital Aeronautical Flight Information File airport descriptions, including geo-specific runways, markings, taxiways, signs, and lights. It also generates millions of trees and other vegetation directly on the GPU, based on land use rasters or aerial features. Customers can use VR-Vantage IG to create and render high-performance buildings, roads, etc. based on OpenStreetMap data for the whole world, including cut-in roads. They can also procedurally add detail and quality to the world by adding procedural geometric noise to the elevation data, and by adding convincing bump-maps based on slope and elevation of mountains. Built-in support for DiSTI’s GL Studio allows customers to build and prototype various cockpit instrument and tactical systems, critical for deploying reconfigurable flight simulators. VR-Vantage IG continues to expand its capabilities, and in turn, its market share. It is built to be deployed on a variety of COTS hardware configurations from simple desktops to multi-channel displays for virtual cockpits, monitor-based training systems and AR/VR components. VR-Vantage IG APIs make it possible to accommodate any training, simulation or mission rehearsal requirements. This approach also supports compatibility with current, existing applications. Want to learn more about the integral pieces of a simulation and their levels of fidelity? See The Tech-Savvy Guide to Virtual Simulation. Interested in a demonstration? Jonathan Searle, a Cranfield University Academic, responsible for the delivery of modelling and simulation to the UK MOD, at the Defence Academy of the UK, shares his own personal insights into the strong relationship between the Defence Academy’s Modelling and Simulation (M&S) programme, Antycip Simulation, and VT MAK. Electronic warfare refers to the ability to use the electromagnetic spectrum to sense, protect, and communicate in theater, most notably through radar and communications. In order to gain an edge in Electronic Warfare, militaries around the world are looking to better detect, understand, and respond to the use of electronic systems. In order to maximize electronic warfare outcomes, training systems are needed to simulate a tactical environment within which teams can learn the tactics, techniques and procedures involved. 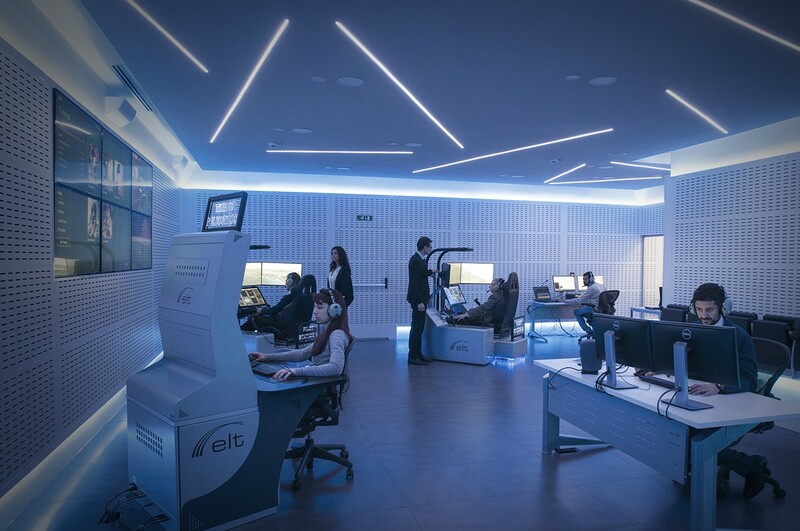 In response to this ambitious challenge, Elettronica SpA, a leader in the field of Electronic Counter-Measures, has teamed with VT MAK and Antycip Simulation to develop the Electronic Warfare Battlelab. The Electronic Warfare Battlelab is a multi-role, multiplatform, joint-force training arena designed to conduct leading edge joint mission exercise sessions that focus on electronic warfare. 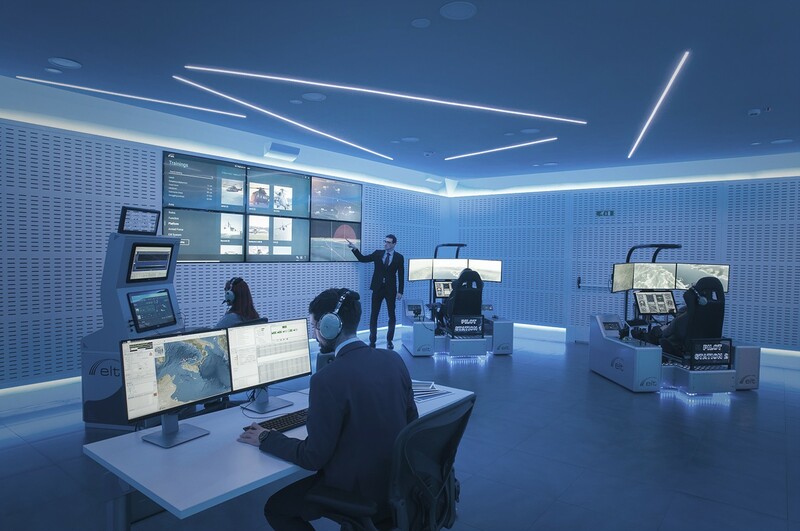 Inside the Battlelab, there are six intelligence stations (two electronic intelligence, one communications intelligence, and three reconfigurable workposts), along with an Intercom communications system to populate audio traffic. Connected to the network are two pilot workstations and one Command & Control Student workstation. An Instructor Operator Station (IOS) serves as a supervision system and delivers visualization and insights to instructors and observers. The IOS station works in tandem with a CGF to supply tactical scenario generation, electromagnetic environment generation. A workstation is dedicated to visual database/3D model generation. An HLA communication infrastructure ties the entire system together. Antycip Simulation assisted Elettronica in determining the best software to bring the system to life, and they chose MAK. VR-Forces powers the IOS, the CGF, and provides a 2D Map view of the simulation for the video wall. VR-Vantage and the MAK Data Logger work in tandem to provide 3D views for after action review. VR-Engage serves as the base of the the two pilot stations. The MAK RTI serves as the backbone of the communication infrastructure. This software arrangement powered the system while retaining maximum flexibility and extendability for future evolutions of the setup. The resulting system is capable of training tasks at the individual level as well as complex coordination actions required of multi-echelon joint-force operations. This enhanced collaboration between different roles and forces creates a more nuanced and beneficial simulation. Elite forces are always looking for an edge, and the quality of the training they receive can be the difference between emerging victorious or failing completely. While nothing can perfectly replicate getting one’s boots on the ground, superior first-person training systems can give a trainee a more lifelike experience that can be directly applicable in the field. With that in mind, Jakarta-based PT. Infiniti Reka Solusi (Infiniti) has chosen to use the entire suite of MAK simulation software, including VR-Engage, MAK’s first-person simulator, as the core of an improved multi-level training system for elite forces. Trainees are now immersed in a complete simulation software system, yielding productive results. The suite Infiniti chose centers on VR-Engage, a multi-role virtual simulator that lets users play the role of a first person human character; a vehicle driver, gunner or commander; or the pilot of an airplane or helicopter. The Infiniti system is a hybrid of command and staff and role player stations. The VR-Engage-powered role player stations interact with a synthetic VR-Forces simulation to provide a complete training experience. Infiniti takes advantage of the customizability of VR-Forces, specifically tailoring it for their clients, including adding and extending specific functionalities. Infiniti is looking to revolutionize the military training experience and generate massive improvements in outcomes. VR-TheWorld Server for a webbased streaming terrain server, and DI-Guy SDK to power realistic human activity. To link the system together, Infiniti will use the MAK RTI to connect HLA federates and exchange simulation data. The MAK Data Logger is used for recording and replay. VR-Engage allows for first-person training as vehicle gunner. For Infiniti, detailed and thorough documentation, open architecture, and customizability set MAK apart from competitors, and embracing MAK’s unique “engineer-down-the-hall” approach has resulted in a superior technical support experience. VR-Vantage provides a rich view into the simulated world. Bolstered by the positive experience it has had with MAK, Infiniti now plans to add Oculus Rift and motion platforms, as well as networked inertia and orientation sensors to its role player stations for an even more immersive experience. BAE Systems, Communication, Navigation, Identification and Reconnaissance (CNIR) is using a suite of tools from MÄK Technologies on various Internal Research and Development (IRAD) projects and in support of major defense programs such as Joint Tactical Radio System (JTRS), Warfighter Information Network — Tactical (WIN-T), Future Combat Systems (FCS) and Airborne/Fixed/Maritime (AMF) — JTRS. To simulate intelligent defense systems that are network centric and contain large scale sensor networks, BAE models and simulates different parts of these systems using a variety of different tools that combine the affects of battlefield communications networks, mobile ad-hoc networks (MANETs), UAV relays, etc., on traditional theatre of engagement scenarios. Their biggest challenge was integrating the diverse tools to create a comprehensive simulation. VR-Vantage Stealth, and the MAK Data Logger to build the simulation and visualization solution they needed. "MAK's products saved us the time of building our own custom applications without sacrificing any of our simulation requirements,” said Walter Whimpenny, Project Lead, Modeling & Simulation. “It would have taken anywhere from six months to a year to develop the capability we wanted on our own. MAK’s off the shelf products have provided a well developed solution that still allows us the flexibility to customize it as we see fit." VR-Forces, BAE is able to simulate the effects of communications on the result of a battle. For example, when an entity modeled in VR-Forces needs to issue a call for fire to another entity, instead of just passing the call for fire message directly to the intended recipient, it sends a query to OPNET, through HLA. OPNET receives this query and calculates whether the message arrives at its intended destination and if so when depending on modeled factors which may affect the communications (e.g., distance, weather, terrain, line of site, routing algorithms, jamming, presence of relays, etc.). On multiple occasions BAE turned to MAK’s technical support for help integrating the products with other simulation tools in their custom environment. MAK also provided technical experts at the BAE facility to both train and work with BAE engineers to address specific technical hurdles. BAE Systems, Communications, Navigation, Identification & Reconnaissance (CNIR) is a unifying force with technically superior solutions that transform the armed forces’ communication, situational awareness, mobility, and mission expertise. Their technical expertise includes: C3I systems, communications systems integration, guidance and navigation, electronic identification, airborne ground-based software development, and modeling & simulation. CNIR is at the forefront of innovation, working to develop the next generation of intelligent systems. VR-Vantage IG helps Calspan double the value of flight tests to both train test pilots and collect data for industry partners. After the Flight Sciences Simulator was upgraded to use VR-Vantage IG, we got a chance to catch up with Jay Kemper, Senior Software Engineer at Calspan. We discussed how MAK’s VR-Vantage IG is used by the Air Force Test Pilot School and what they are learning using the VR-Vantage product. “MAK supports the Air Force Test Pilot School at Edwards AFB with VRVantage IG; an image generator product. VR-Vantage IG has been used in the Flight Sciences Simulator to train the next generation of test pilots in everything from aerodynamics to flight control design”, said Mr Kemper. Students have a one year curriculum and they run courses starting every six months so there is a six month overlap in the programs. A physics-based flight simulation model is used to learn the effects of aerodynamics. For example, they halve or double the effects of one of the flight controls so the pilot can experience the effects on the performance and maneuverability of the aircraft. Each class has a capstone event which is a flight test. A flight test is a controlled experiment where most of the flight conditions are known (controlled) and specific characteristics are varied so they can be measured to collect data and learn about the effects of the variable. The school has moved beyond using the flight tests as just training exercises, now they are also partnering with industry leaders (e.g. Cessna and Lockheed) to perform tests as needed for research and development. It’s a win-win — the school gets to learn flight testing skills and the industry obtains valid flight test data. 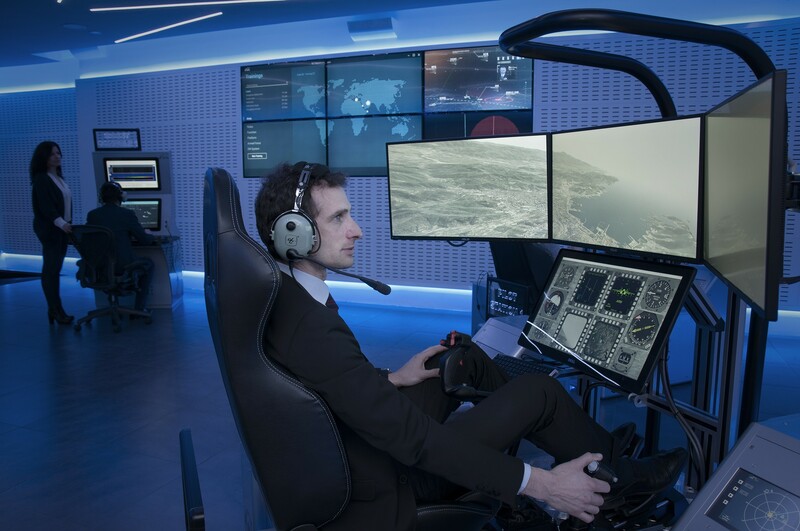 “One of the most advanced uses of the simulator is to connect it to a programmable aircraft and use the simulator as a ground cockpit”, said Mr Kemper. Calspan is studying issues with unmanned aircraft systems, e.g. the effects of delays in satellite communication relays. The Calspan test aircraft is a Learjet 25 with a four man crew. The aircraft has a programmable flight control system, enabling the crew to get the plane into a controlled situation, then turn control over to the ground station to carry out the test. The ground control station can land the Learjet while the crew stands by with emergency override control in case anything goes wrong. “VR-Vantage uses the data from the aircraft to generate the scenes of the terrain to a very high degree of accuracy, allowing for an aircraft to be landed with no video stream”, said Mr Kemper. The aircraft sends position, orientation, and status data to the ground station using a C-Band radio, and Calspan can get update rates up to 60 Hz. The terrain database was built by AFRL using TerraVista (TerraPage format). Calspan is working with the UAS community to help set standards for how to test UAS, as simulation is always an integral part of flight testing. The flight test is the important part because the simulation can remove some, but not all doubt. By using the “Workload BuildUp Approach”, simulation can be used to run many iterations and flush out problems. Want to learn more? Have a look at the VR-Vantage page for more information. Are you interested in seeing a demonstration? It can take an athlete up to 18 months to return to sport after a torn ACL; even after surgical reconstruction and physical therapy, the athlete has up to a 30% chance of sustaining a second injury. Additionally, athletes have between a 50-100% chance of developing osteoarthritis within 20 years of their initial injury. Prevention of these types of injuries is key and it is especially important to know when it is safe for athletes to return to sport after such an injury. The TEAM VR (Training Enhancement and Analysis of Movement Virtual Reality) Laboratory in the Division of Sports Medicine at Cincinnati Children’s Hospital Medical Center is leading the development of virtual environments to objectively quantify the progress of injury prevention training and physical therapy so that adolescent athletes can perform at a high level. TEAM VR has chosen VT MAK’s DI-Guy human simulation software to help create sport-specific scenarios for training and evaluation. TEAM VR’s virtual environments aim to give physicians, physical therapists, athletic trainers, practitioners, and strength and conditioning specialists the tools to accurately measure the biomechanics of a child athlete (joint movements, strength, or flexibility for example) by actively engaging him/her in realistic, immersive sport scenarios; these scenarios are performed in a virtual environment that mimics competition on the field/court of play. The TEAM VR laboratory is equipped to utilize virtual environments for knee injuries, as well as concussion prevention. It can also be used as an education simulation center to help sideline first responders like athletic trainers and team physicians gain experience with sideline injury scenarios. The TEAM VR environment is different than computer assisted virtual environments (CAVE ) in that the participants are not tethered to the equipment and are able to move naturally over ground without the use of a treadmill. It is fully integrated into the world-renowned Human Performance Laboratory and utilizes 35 motion capture cameras to detect the location of the athletes. Athletes wear a head-mounted display to transmit the virtual environment via a customized wireless video system that updates the display in close to real time. The virtual environment will use DI-Guys to represent opponents, teammates, and coaches/instructors. The goal is to get the athletes actively playing the sport so that clinicians can measure modifiable injury-risk biomechanics to enhance movement adaptations and provide feedback in a safe, controlled space. Of course, the athletes are not actually kicking, throwing, or catching balls: the time lag of present VR systems does not allow for such things. Rather, unique scenarios are created to mimic portions of sportspecific maneuvers such as the approach, jump, and land during a basketball rebound. While the athlete does not actually experience the feedback of interacting with a physical ball, the athlete is immersed in such a way that he or she must respond and adapt to the movement patterns of teammates and opponents in the scenario, and even the flight of the ball. Thus the virtual environment provides a safe space for the athlete to push to a higher level, while simultaneously training him/her to better attend and react to the constant change of their surroundings. MAK's DI-Guy software provides the artificial intelligence (AI) engine to drive three key immersion components for athletes, patients and practitioners when inside the virtual environment: (1) Strategic immersion, (2) social immersion, and (3) narrative immersion. Strategic immersion is utilized to mentally engage the user in the simulation and is made up of a combination of immediate, physical responses and more cerebral, cognitive decisions that underlie the overall strategies the user must adopt to complete sport-scenario tasks. Social immersion engages the user with other non-player characters that may be controlled by either AI or by another human that is sharing the virtual environment with the user. If it is difficult for the user to tell the difference between a human-driven or a computer driven character, the social immersion is high. Finally, the narrative immersion is used to build story that the user can become invested in and dictates how much he or she cares about the additional non-player characters and overall task goals. Together, these three components encourage real-world like performance that is transferable to the real world. Adam KIEFER, PhD Director, TEAM VR Laboratory. The University of Alabama in Huntsville (UAH) is using MAK’s VR-Forces simulation software to recreate the Battle of 73 Easting, a major United States victory during the 1991 Persian Gulf War, enhancing its students’ learning experience. With VR-Forces, graduate students at UAH have achieved increasingly accurate replication of the historical results. The simulations are directed by Mikel D. Petty, Ph.D, Associate Professor of Computer Science and Senior Scientist for M&S, Information Technology and Systems Center at UAH. “The Battle of 73 Easting is arguably the best-documented battle in U.S. history, which makes it a perfect application for both simulation analysis and historical study,” said Dr. Petty. VR-Forces is MAK’s complete simulation solution software. It is a powerful and flexible Computer Generated Forces platform that populates simulated synthetic environments with battlefield entities. Users can create scenarios full of custom, lifelike entities with specific behaviors, making it an ideal platform for training and education. The VR-Forces software also allows students to alter the parameters of the battle and compare simulation results with historical events. This year, under Dr. Petty’s guidance, his students will be investigating the change in outcome given a notional scenario in which the Iraqi forces were able to use modern T-14 Russian Armata battle tanks in 1991. The volume of air traffic is escalating rapidly worldwide. Policymakers in Europe are looking at ways to balance this growth with the needs of air safety, environmental concerns, security needs, and economic competitiveness. SESAR seeks to predict, model and manage aviation challenges. However, the bespoke simulation equipment required to achieve a high level of accuracy is both complicated and expensive. Therefore, Europe’s aviation industry sought a more cost effective and collaborative way to approach this. Sopra Steria, a leader in IT integration, has been providing intelligent transport systems for more than 40 years. 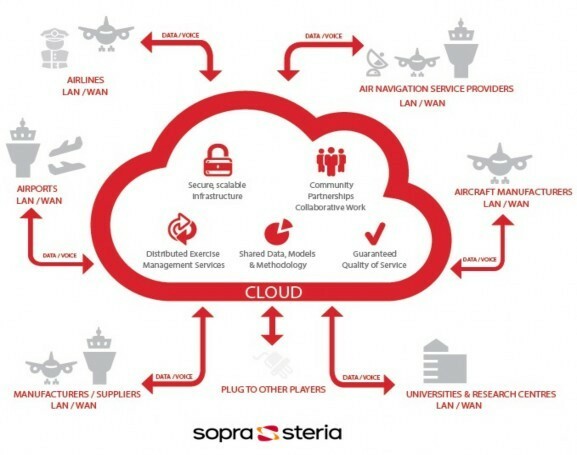 In collaboration with a number of aviation industry partners, Sopra Steria took charge of architecture and operations behind an innovative research and development project aimed at responding to this industry-wide need. The project successfully delivered the first European airspace simulation platform. This is now a commercial service that is being used by a number of organizations. Named Shared Virtual Sky, it enables the interconnection of aviation company systems, particularly airborne (cockpit) and ground navigation (air traffic control) systems. 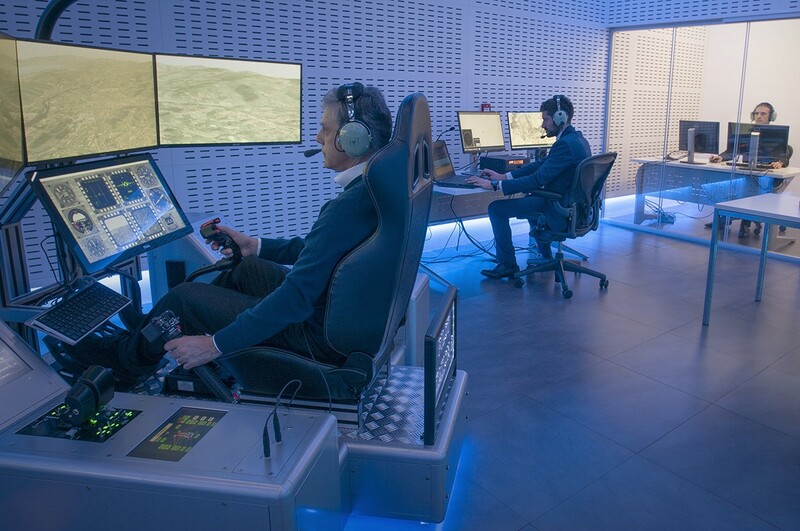 Participants connect their simulators to a high-fidelity real-time environment that supports specific flight simulations in rapidly changing conditions. 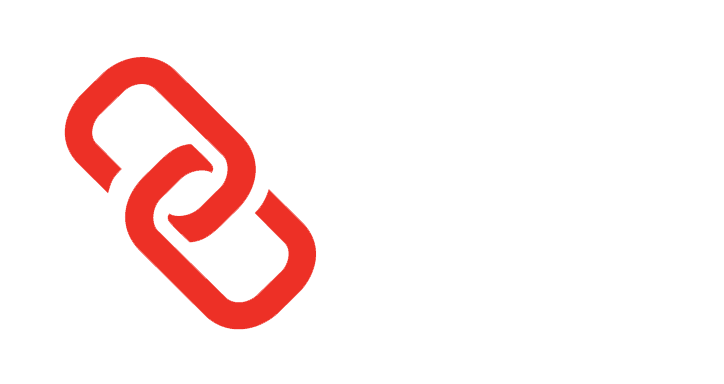 Sopra Steria chose the MAK RTI as the linking software because of its stability, its ability to work in a Wide Area Network (WAN) environment, and its adherence to the HLA IEEE 1516 specifications. The MAK RTI enabled Sopra Steria to speed up the development of the middleware layer (the “interoperability layer”) of this multi-partner Air Traffic Management simulation. Antycip Simulation is an expert provider of simulation, modeling, and display solutions, and related services. Antycip’s experience was crucial in the development process and integration of MAK products. Aircraft Manufacturers and ATC authorities in Italy, Germany, France and Sweden are now using Shared Virtual Sky to derive a number of business and operational benefits. Theses include: improved ability to predict the position of an aircraft’s trajectory for better traffic management, enhanced security of aircraft traffic due to better demand and capacity balancing, and more realistic and relevant training for airport staff and aircraft operators. The ability to collaborate in a virtual environment accelerates innovation by enabling simulations using new air space management techniques and provides cost-effective validation and verification of planned and potential air traffic flow. The Federal Aviation Administration (FAA) is using its Next Generation Air Transportation System to transform the world of flight management and operation as we know it. NextGen is an ongoing overhaul of our current National Airspace System (NAS), planned and demonstrated to enhance safety, reduce delays, and save fuel - all while diminishing aviation’s negative impact on the environment. The initiative uses new and existing technologies, including satellite navigation and advanced digital communications, to connect airports and aircraft in our NAS with continually shared real-time information. The NextGen Integration and Evaluation Capability (NIEC) Laboratory is the FAA’s research platform to explore, integrate, and evaluate NextGen concepts through simulation activities. It has chosen VT MAK’s VR-TheWorld as the streaming terrain server to stream imagery and elevation data into several of these Next- Gen simulations, including Aircraft Access to SWIM, or System Wide Information Management, (AAtS), and a Weather Technology in the Cockpit (WTIC) study. Promoting collaborative decision-making among all players in air traffic management, AAtS will increase the efficiency of air traffic operations by sharing relevant information to flight crews through a common information source. It will evaluate pilot situational awareness (SA), workload, and voice communications, in addition to the strategic planning of increased and more timely delivery of weather, flight, and aeronautical information to the cockpit through day-flight simulations. The FAA’s first study using VR-TheWorld, this human-in-the-loop experiment features the Dallas Fort Worth International Airport inset into the VR-TheWorld database. Aircraft Access to SWIM is the flight deck extension of SWIM, which provides an open, flexible, and secure information management architecture for sharing NAS advisory data and enabling increased common situational awareness and improved NAS agility. In an effort to better understand pilot decision-making in adverse weather conditions during flights through the Inter-tropical Convergence Zone (ITCZ), the FAA , in partnership with the National Centre for Atmospheric Research (NCAR), are developing a cockpit flight simulator for conducting experiments for NextGen pilot aids. They are using VR-TheWorld for a level 4 fixedbase flight training device. The goal is to determine how auxiliary avionics – in the form of an electronic flight bag, an electronic display system used primarily in the cockpit or flight deck– can boost the safety of transoceanic flights. The study will include two airline crews flying simulated moonless night missions from Miami to Lima, Peru to investigate methods of displaying satellite-based weather in the cockpit. The fixed-base simulator used an Airbus A320 cockpit with sidestick, rudder pedals, flight management system and ACARS thermal printer, but with reconfigurable displays featuring touchscreen controls to model other avionics and hardware. Delivered with a global base map, VR-TheWorld can be easily populated with custom source data through a web-based interface. The server can be deployed on private, classified networks to provide streaming terrain data to a variety of simulation and visualization applications behind a firewall. MAK’s most recent release, VR-TheWorld 2.0, adds the ability to store and stream feature data including roads, buildings, and trees to multiple applications simultaneously. The amount and quality of imagery and elevation data included with the server has been expanded, and also allows the user to add geospatial data to distribute in real-time. By using VR-TheWorld, the FAA and the NIEC Laboratory have the most accurate feature and elevation data of the “virtual globe” at their fingertips, helping them to determine the most cost-effective and practical methods of bringing satellite-linked systems to all of the National Airspace System. For a recent Air and Land Command & Control Integrated Systems project, the team at MLM developed a new management approach that draws on the company’s expertise and existing customer infrastructure, as well as on currently available technology and advanced Information Technology (IT) tools. The system is the result of over thirty years of significant knowledge and experience in designing and executing national and theater information C4I systems. It offers decision makers’ complete command and control over their forces in peacetime, during times of crisis, in Operations Other Than War (OOTW), and in full-scale conflict. It generates a unified rapid and reliable Situation Picture (SP), while also automating data collection, transfer, processing, management, protection, and dissemination through secured communication networks utilizing Internet/Intranet Technology in near real-time. While efficiently and effectively utilizing the Armed and Paramilitary Forces and Civilian Organizations, MLM’s new management system also enables Central Headquarters to perform command and control functions at all times. The building blocks for the MLM system are the Air Defense, Navy, Army, National Guard, and Police Control Systems that together provide an overall Integrated Common Situation Picture (ICSP). The other major components include databases, data management tools, information and automatic data processing systems, decision support tools, display systems, and communication networks. Based on the HLA standard, MAK's VR-Link is used as the basic infrastructure for the system’s main data bus connecting all data sources to all the operational stations, enabling the distribution of the Situation Picture, and smoothly merging simulated entities with real live entities. A VR-Link-based component is added to all the applications in the bus, including the operator’s stations with its well-designed map display. Because HLA is implemented and well-supported by VR-Link and because the tool makes it easy and riskless to implement a distributed network data bus, the team at MLM took advantage of the HLA open standard for their management system. 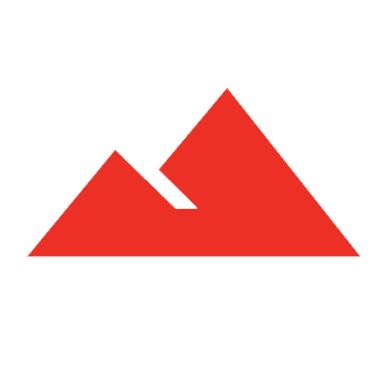 MLM is a multifaceted design, development, and systems engineering organization. Its projects include Air and Missile Defense Systems, Advanced Avionics, Simulation and Training Systems, Crisis and Emergency Management Solutions, and C4I Air and Land Command & Control Integrated Systems. It is part of Israel Aerospace Industries (IAI) Ltd’s Systems, Missiles, and Space group. IAI is the largest aerospace and defense company in Israel, specializing in solutions for a wide range of air, land, sea, space, and homeland defense needs. IAI creates and supplies advanced systems for Israel’s Ministry of Defense and other groups worldwide. Raytheon Integrated Defense Systems selected MAK to develop the simulation system to drive the wargaming & training component of their Command View C4I system that was subsequently delivered to a Raytheon customer. The C4I system is used for national defense and simulated Command Post Exercises at the division, brigade and battalion levels, providing opportunities for experimentation, doctrine development, and training. 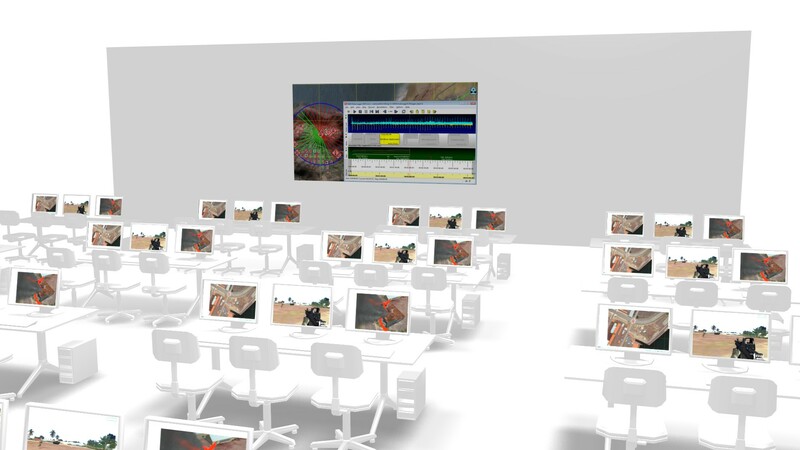 MAK used VR-Forces' flexible architecture to develop and deliver a MAK Command and Staff Training System (MAK CST) to stimulate Raytheon’s C4I system. MAK CST acts as the simulation engine for operational level training exercises — it feeds the C4I system with track data and reports from simulated forces. Commanders and their staff lay down the Order of Battle and participate in the exercise using the same C4I system they would use in a real-world battle, while members of their organization direct the simulated forces by interacting with MAK CST in the simulation cell. This two year project resulted in VT MAK delivering a fully compliant system, on time, and within budget. Deliveries included documentation, training, comprehensive test procedures, and on-site integration support. The newly developed software has been integrated into the COTS VR-Forces product for ease of maintenance and upgrade. The system includes the VR-TheWorld Streaming Terrain Server. When Terma was chosen to upgrade Command, Control and Communication (C3) systems on the Royal Danish Navy’s Flyvefisken class ships, they started looking for commercial off the shelf tools to save development time. They needed products that had the same flexibility they were building into their C-Flex systems. The C3 systems technology upgrade is based on the new Terma C-Flex platform and incorporates all operational and technical experience from many years of operations of the current C3 systems onboard twenty-one vessels of the Royal Danish Navy. The C-Flex software is a true component-based architecture. The main advantages are flexibility in configuration, reduced test requirements, open to third party software and reduced maintenance costs. The ASOC (Air Support Operations Center) Battlefield Simulation fills a crucial gap in USAF and United Kingdom Close Air Support (CAS) and airspace manager training. The system provides six squadrons with the capability to conduct total-mission training events whenever the personnel and time are available. When the 111th ASOS returned from their first deployment to Afghanistan they realized the training available prior to deployment was inadequate. They sought an organic training capability focused on the ASOC mission that was low cost, simple to use, adaptable, and available now. With the assistance of VT MAK, they developed a complete training system based on VT MAK’s QuickStrike HLA-based simulation. Through more than two years of spiral development, incorporating lessons learned, the system has matured, and can now realistically replicate the Tactical Operations Center (TOC) in Kabul, Afghanistan, the TOC supporting the mission in Iraq, or can expand to support a major conflict scenario. The training system provides a collaborative workspace for the training audience and exercise control group via integrated software and workstations that can easily adapt to new mission requirements and TOC configurations. The system continues to mature. Based on inputs from the warfighter, new capabilities have been incorporated to add realism and simplify the scenario development process. The QuickStrike simulation can now import TBMCS Air Tasking Order air mission data and can provide air and ground tracks to a common operating picture; presented through either TACP CASS or JADOCS. Rheinmetall Canada delivered an Air Defense Operations Simulation (ADOS) for the Dutch Army to be used for decision-making training of the staff of the air defense units responsible for Command and Control (C2). The Dutch Army is fielding new Ground Based Air Defense Systems (GBADS) from Rheinmetall and integrating these with Short Range Air Defense (SHORAD) systems, requiring new training systems for tactical decision-making as opposed to purely operation training. The ADOS system is also being used as an aid in the development of air defense Doctrine, Tactics, Techniques, and Procedures (DTTP). The training system comprises a simulation network connected to a copy of the operational C2 system. 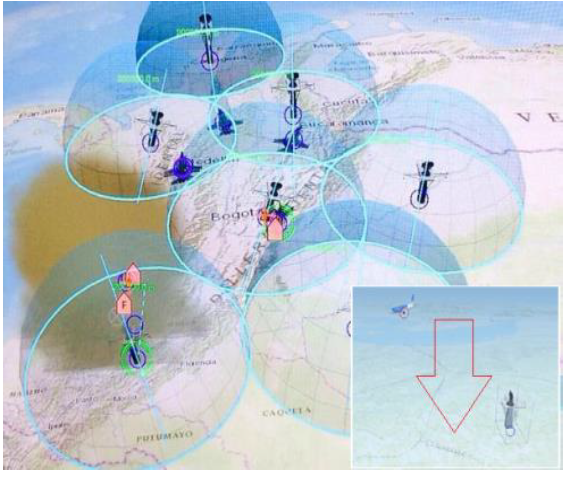 VR-Forces, MAK’s simulation solution, provides scenario generation and modeling of ground and air threats and blue force including the mobile GBADS. VR-Vantage is used as the primary interface for the role players which include the Stinger Weapon Platform platoons, the Norwegian Advanced Surface to Air Missile System (NASAMS) fire units, and opposing forces. All positions are connected via the High Level Architecture (HLA) through the MAK High Performance RTI. Students, making up the Staff platoon, are at copies of the operational C2 system. The MAK Data Logger supports After Action Review. “MAK’s VR-Forces and VR-Vantage combination of providing out-of-the-box capabilities with a powerful API for easy customization made them the ideal choice as the simulation and visualization component of the ADOS System. The technical capabilities of MAK’s products coupled with their excellent reputation for unsurpassed customer support made the decision to team with MAK an easy one,” said Ledin Charles, ADOS Program Manager, Rheinmetall Canada. As aviation technology has improved, commercial air traffic has increased significantly, requiring better airspace management techniques. In an attempt to develop better air capacity, safety, and flexibility, NASA’s Air Traffic Operations Laboratory (ATOL) used a massive simulation environment called Air and Traffic Operations Simulation (ATOS) to explore better techniques. As the project’s success lead to its growth, NASA required a licensing option that would be easily scalable in a simulation that is ever-expanding. NASA originally needed a tool that could effectively communicate and maintain all the entities involved in its complex, multi-laboratory, simulation that includes 400+ workstation-based high-fidelity aircraft simulators networked together. The simulation would eventually demand a creative, flexible solution so that licensing restrictions would not hinder its development. VT MAK offers commercial-off-the-shelf (COTS) technology to facilitate Air Traffic Management simulations, backed by a company with an “engineer down the hall” philosophy to help organizations creatively solve their implementation issues. The MAK RTI has been used by ATOL for over a decade to enable their High Level Architecture (HLA) federations to rapidly and efficiently communicate the positioning and actions of entities in the ATOS simulation. It was also used to communicate with external laboratories at NASA LaRC, NASA Ames Research Center, FAA and other compliant facilities. As the simulation’s success led to the growth in the number of federates and labs involved in the simulation, NASA’s needs changed. The ATOL required a way to use unlimited instances of the MAK RTI, and needed to do it in a way that would be cost-efficient. MAK’s “engineer own the hall” philosophy played a big role in ensuring success, as we worked out a custom licensing model to meet their needs and ensure that MAK would continue to play a role in the success of the ATOL. Want to learn more? Have a look at the MAK RTI page for more information. Interested in seeing a demonstration? The Air Defence Ground Environment Simulator (ADGESIM) was developed by the Defence, Science and Technology Organization (DSTO) to evolve Royal Australian Air Force (RAAF) training systems and prepare personnel for network-centric operations. ADGESIM, a network-centric aerospace battle management application, is a major component of the RAAF strategy to adopt distributed simulation technology. ADGESIM is comprised of three applications developed by DSTO and YTEK (DSTO engineering contractor) in C++ and closely integrated with VR-Forces and VR-Link. The ADGESIM Pilot Interface is used to create and fly simulated aircraft entities. All high resolution entity modeling is done in the background by VR-Forces and ADGESIM entities have been proven compatible with both Australian and US Navy distributed simulation environments. The RAAF routinely runs scenarios with eight Pilot Interface workstations simultaneously without taxing the PC-based ADGESIM system. Arriving on the floor to setup for a trade show, Ivan finds himself in a stressful situation: Only 4 hours for setting up a demo of a collaborative Light Armored Vehicle (LAV) simulator. The new partner, ADVENTUREtech, just introduced a display system that needs to become part of the simulation. "VT MAK's product suite transformed a booth with a display system into a fully-functional, team-oriented training demonstration." MAK used its Light Armored Vehicle (LAV) simulator built on VR-Forces and VR-Vantage to set up this system. VR-Vantage IG is used to provide trainees with high-detail role-specific visual scenes. VR-Vantage's multi-channel distributed rendering architecture makes it easy to configure a continuous scene across a CAVE display. The CAVE is a form of display that displays scenes onto three to six sides of a cube. CAVEs provide a wide viewing angle that makes an immersive environment for the Driver without the expense of edge blended dome displays. This display is a good match with the ergonomically positioned driver controls that make driving natural and leave the operator's attention on the mission. The Gunner's view is presented on a single monitor and operated with a commercial game controller. The gunner IG supports daylight visual and night vision scenes, toggled by a switch on the game controller. 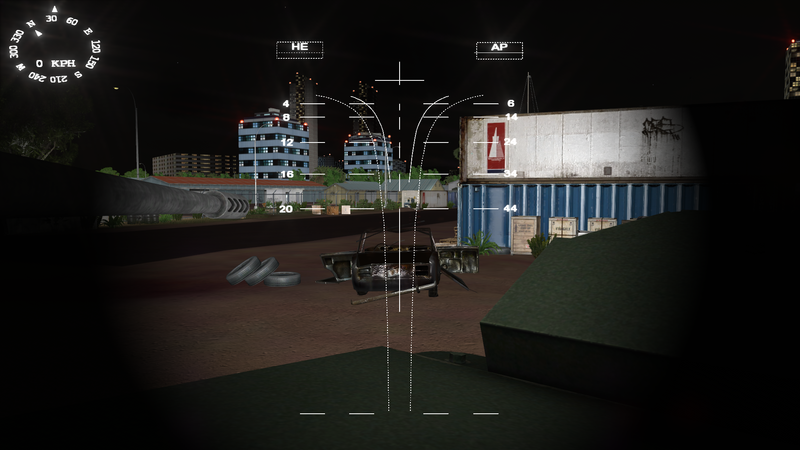 This lower fidelity interface is appropriate if the gunner’s tasks focus on targeting decisions and communicating with the commander, but could be implemented with higher fidelity interfaces if shooting skills were important. The Commander is using the Oculus VR headgear to present a fully immersive display that is reactive to his head position and movements. A video monitor is used to show observers what the Commander is seeing. 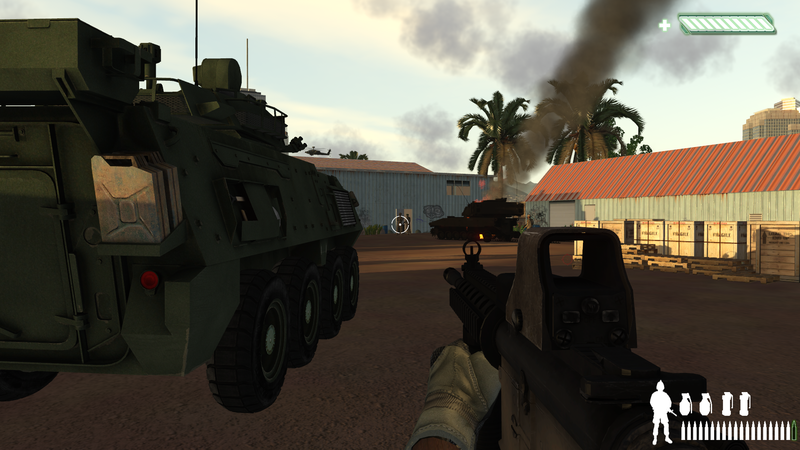 The VR-Forces simulation engine is hosting the light armored vehicle ownship simulation. It uses CM Lab’s Vortex physics engine to model the vehicle and gun dynamics. Because it’s based on VR-Forces simulation framework, it can coordinate user inputs from each of the operators, provide terrain access to the Vortex models, and handle the weapons effects, sensors, and damage models for the vehicle. The terrain used is Simthetiq’s SUROBI VTE, a terrain database hand built from source data from the Surobi valley in Afghanistan. This database provides high performing models with close-up detail of a typical Afghan village. The virtual simulator is connected through the network, using VR-Link, to two other simulations. VR-Forces CGF, which simulates neutral, friendly and opposing force entities. VR-Forces enables instructors to pre-plan training scenarios where non-player AI move and interact based on mission plans, reactive tasks, and triggers based on the actions of other entities in the simulation. Instructors and role players can interact at several levels: they can give squad leaders tasks and have the members of the squad follow those instructions, they can command individual entities, or take first person control of vehicles and human characters. DI-Guy Scenario can add additional human characters to the simulation that model the patterns of life in the village and react to the actions of the LAV. VR-Forces, VR-Vantage, and DI-Guy Lifeform Server include MAK’s networking technology. VR-Link’s protocol independent API allows all three applications to communicate through industry standard High Level Architecture (HLA) and the Distributed Interactive Simulation (DIS) protocols, including HLA 1.3, HLA 1516, HLA Evolved, DIS, and DIS 7. The MAK Data Logger records and plays back all the network simulation traffic for after action review and analysis. The MAK RTI (runtime infrastructure) is available when connecting to HLA federations using any of these SISO standard protocols: HLA 1.3, HLA 1516, and HLA Evolved. Want to learn more about virtual simulation? Interested to see a demonstration? In this use case, the trainees are military commanders who interact with the real C4I interface, which is configured to be in a training mode. Role players contribute to the simulation scenarios. And white-cell operators manage the exercise making sure the scenarios stay on track. Working as a subcontractor to Elbit Systems, VT MAK delivered a modified version of VR-Forces that was used as the simulation engine for a Command and Staff Trainer for the Dutch Army. VR-Forces is used for scenario authoring, simulation execution, and as a role-player station for white-cell operators and instructors. VR-Forces-simulated entities, and other objects, are displayed on the C4I system's map. Elbit, the developers of the C4I system, wrote a Gateway application using VR-Link and the VR-Forces Remote Control API that translates between the HLA protocols spoken by VR-Forces, and the C4I protocols used by the operational C4I system. The Dutch system employs several VR-Forces simulation engines to share the load of simulating several thousand objects. This project focuses on the tactical level more than the operation level. For example, it had requirements for 3D views (UAVs camera displays and "pop the hatch" out-the-window views for operators playing the role of company commanders), thus, much of the actual simulation is at the entity level rather than the more constructive true aggregate level. The Norwegian Defence Research Establishment (FFI) has established a demonstrator for experimentation with command and control information system (C2IS) technology. The demonstrator is used for studying middleware, different communication media, legacy information systems and user interface equipment employed in C2ISs. MAK’s VR-Forces, computer generated forces simulation toolkit is a component of the demonstrator serving as the general framework for rapid development of synthetic environments. It is used for describing the scenario and representing the behavior of most of the entities in the environment. The demonstrator’s flexible and extendable HLA based synthetic environment supporting VR-Forces participation as a federate in the HLA federation, allowing it to exchange data with entities and systems represented in external simulation models. Large investments have been made developing simulation systems that model and simulate various aspects of the military environment. Networking these together enables building systems-of-systems that model larger and more complete operational scenarios. Connecting these to operational C2, C3, C4I, and Mission Command systems allows commanders and their staff to have experiential learning opportunities that otherwise could not be achieved outside of actual conflict. MAK’s VR-Link interoperability toolkit is the de facto industry standard for networking simulations. MAK’s implementation of the HLA run time infrastructure (RTI) has been certified for HLA 1.3 and HLA 1516, and is currently being certified for HLA 1516:2010. The MAK RTI has been used in many federations, some with over a thousand federates and tens of thousands of simulated entities. MAK’s universal translator, VR-Exchange, has been sold as a COTS product since 2005 and was first developed for and used on the US Army Test and Evaluation Command (ATEC) Distributed Test Event 2005 (DTE5) linking live, virtual and constructive simulations for the first time. Since then it has been used on many programs and at many sites to link together live (TENA), virtual (HLA), and constructive (DIS) simulations. MAK has interfaced Battle Command to operational Command and Control Systems including C2PC, Cursor on Target, and JADOCS for the USMC and USAF. Previously we developed an interface for FBCB2. The US Air Force selected MAK interoperability products for use on the Air Force Modeling and Simulation Training Toolkit (AFMSTT) program and we have successfully completed delivery. The MAK tools include the new MAK WebLVC Server, VR-Exchange, VR-Link and MAK Data Logger. Based on the Air Force's Air Warfare Simulation (AWSIM) model, the AFMSTT system enables training of senior commanders and staff for joint air warfare and operations. MAK's tools are being used to help migrate the AFMSTT system to a service-oriented architecture based on High Level Architecture (HLA) interoperability and web technologies. The U.S. Marine Corps Tactical Operations Group (MCTOG) uses advanced human simulation, ECO Sim to model blue forces, oppositional forces, and civilian pattern-of-life to train captains two weeks prior to deployment in Afghanistan. ECO Sim trains IED defeat missions simulating sophisticated human networks of financiers, bomb makers, safe houses, leaders, and emplacers. These IED networks operate within a larger backdrop of ambient civilian behavior: farmers in fields, children attending school, families going to marketplaces and religious services. The Marine captain commands searches, patrols, and detentions, all while monitoring the battlefield using ISR data provided by UAS and stationary cameras. In addition, ECO Sim has a sophisticated report capability, mimicking the way Marines will actually convey and receive information in the battlefield. Understanding, Preparing for, and Combating Cyber Attacks. As technologies continue to advance and become more deeply ingrained in modern life, threats of a crippling cyber attack or electronic warfare (EW) become increasingly probable. 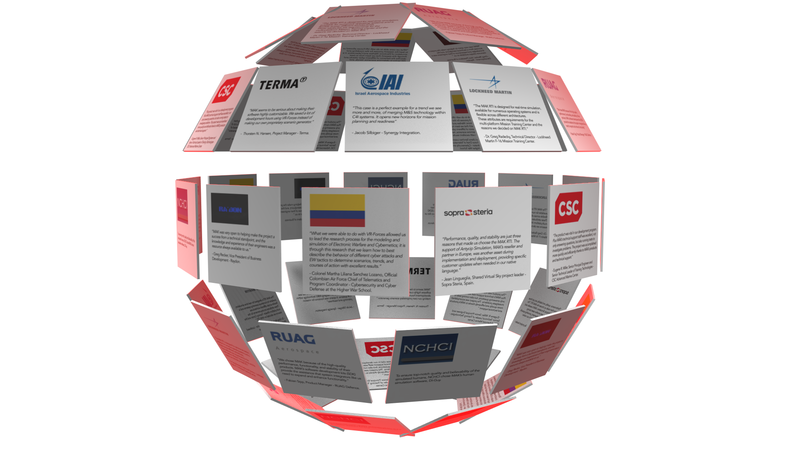 In an attempt to mitigate these risks, the Colombian national government (represented by the Ministry of Information Technology), the Higher War School in Colombia, and ITM Consulting Company joined forces to explore the role simulation plays in understanding, preparing for, and combating cyber attacks. To build electronic warfare scenarios, the organizations needed a tool that could create and model elements vulnerable to cyber attacks, such as radar systems, military and civilian entities, and communication systems; they chose VT MAK’s VR-Forces simulation software tool for the job. 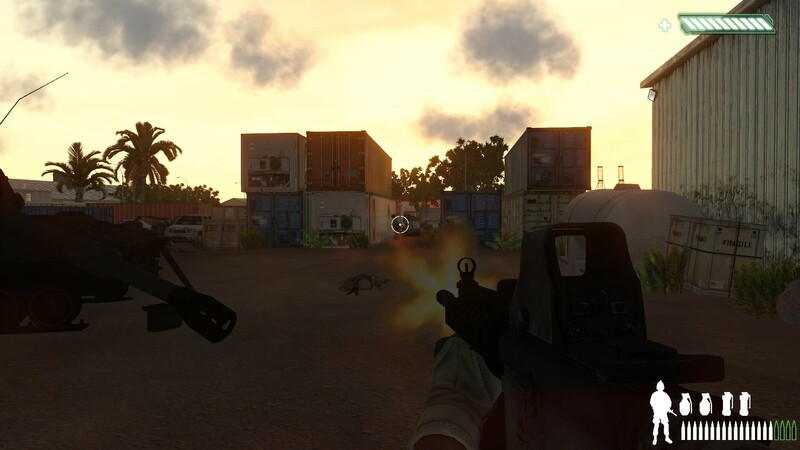 VR-Forces not only allowed them to create scenarios to play out different threats in different environments, but also gave them the freedom to redesign the User Interface (UI) to match specific scenario needs. The group conducted three major cyber attack scenarios, which they are using to create response strategies. In the first scenario, VR-Forces simulated two aircraft teams, where the red team was given a mission to use scanners and jammers to alter the frequency on the blue team’s radar systems; doing this enabled the red team to use attack aircraft to undermine the blue team’s defense system (see Figure 1). The second scenario uses VR-Forces to simulate an electronic warfare attack on the Colombian oil infrastructure, a victim of frequent terrorist attacks. In this exercise, the red team was instructed to alter the readings on specific valves on a pipeline to ignite fires. Additionally attacks on the blue team’s surveillance systems (unmanned aircraft) set out to deter the blue team’s response (see Figure 2). A third scenario highlights the danger to civilian population if the turbines in a hydroelectric plant are compromised through a cyber attack. The red team in this situation instigates drastic variations in water levels at the plant that in turn disrupt the power and energy generated to the nearby town. The power and energy disruptions bring about detrimental consequences for the simulated town (see Figure 3). The exercises using VR-Forces have contributed to research and development efforts led by the Department of Telematics ESDEGUE, and in particular its line of research in Cybersecurity and Cyber Defense. "What we were able to do with VR-Forces allowed us to lead the research process for the modeling and simulation of Electronic Warfare and Cybernetics; it is through this research that we learn how to best describe the behavior of different cyber attacks and EW tactics to determine scenarios, trends, and courses of action with excellent results,” says Colonel Martha Liliana Sanchez Lozano, the Official Colombian Air Force Chief of Telematics and Program Coordinator of Cybersecurity and Cyber Defense at the Higher War School. Want to learn more? Have a look at the VR-Forces page for more information. interested in seeing a demonstration? Configure, customize, and extend our products to meet your project requirements. Whether you want to add an airborne sensor asset to an existing exercise or to host a classroom full of beginner sensor-operators, VR-Engage Sensor Operator offers a quick and easy way to integrate with simulation systems right out of the box as shown in Figure 1. Experienced participants can use it to provide intel from their payload vantage point and beginners can gain baseline training. All of MAK products are terrain- and protocol-agile, allowing you to leverage your existing capabilities while attaching a gimbaled sensor to any DIS or HLA entity in your existing simulation system. Before operating a sensor system in the real world, operators need training for in-depth sensor system operation. This training is done with the combination of VR-Forces as the simulation engine and VR-Engage as the Sensor Operator role player station. VR-Forces is used to design scenarios that require the learning of essential skills in controlling the sensor gimbal. It provides a way to assign real-world Patterns Of Life and add specific behavioral patterns to human characters or crowds. Fill the world with intelligent, tactically significant characters (bad guys, civilians, and military personnel) to search for or track. Create targets, threats, triggers and events. VR-Forces is also the computer-assisted flight control for the sensor operator’s aircraft. VR-Engage can be configured to use custom controllers and menu structures to mimic buttonology and emulate the physical gimbal controls. Adding SensorFX to VR-Engage will further enhance fidelity -- emulating the physics-based visuals so that they provide the same effects, enhancements, and optimizations as the actual sensor. In short, students can train on a replica of their system configuration. Before integrating with a larger mission, the Sensor and platform operators must learn to operate tactically as a Remote Piloted Aircraft unit. These skills can be acquired while training side by side on a full-mission trainer. 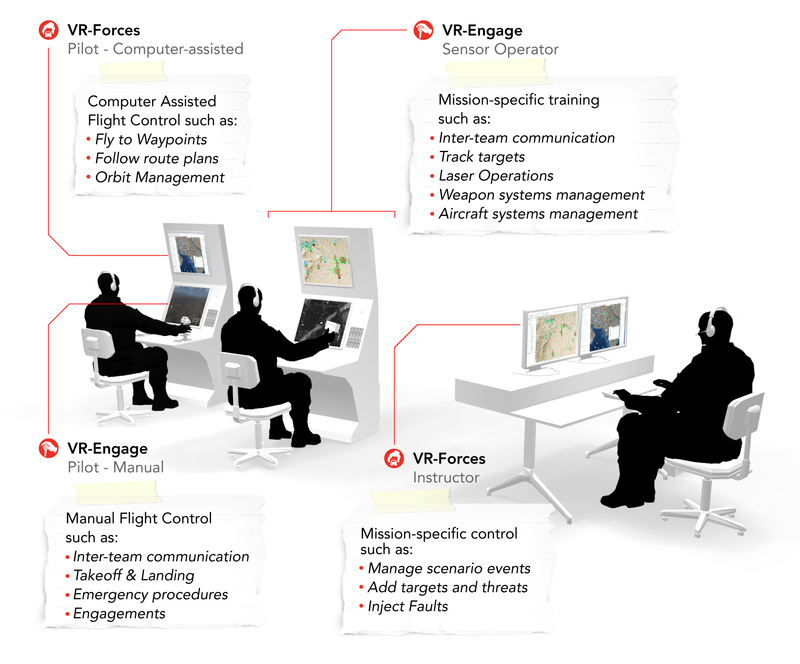 The stations in Figure 3 use combinations of VR-Forces and VR-Engage to fulfill the roles of the Instructor, the Pilot of the aircraft, and the Sensor Operator. In the Pilot station, VR-Forces provides the Computer-Assisted flight control of the UAV. 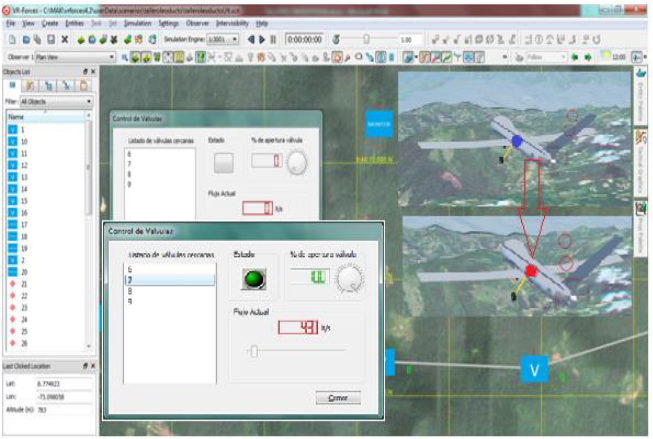 Through the VR-Forces GUI’s 2D map interface, a user can task a UAV to fly to a specific waypoint or location, follow a route, fly a desired altitude or heading, orbit a point, and even point the sensor at a particular target or location (sometimes the pilot, rather than the Sensor Operator, will want to temporarily control the sensor). A user can also create waypoints, routes, and other control objects during flight. In addition, the VR-Forces GUI can show the footprint and frustum of the sensor to enhance situational awareness (in 2D and 3D). VR-Engage provides manual control of the aircraft, including realistic aircraft dynamics and response to the environmental conditions. In this role, the Pilot can choose to see what the sensor sees, even share control with the Sensor Operator. VR-Engage provides the role of the Sensor Operator, letting the user manually control the gimbaled sensor on the platform. In this role, the Sensor Operator gains the required set of advanced skills and tactical training to become an integral part of the mission. They learn to acquire and track targets, prioritize mission-related warnings, updates, radio communications. This is where the scenario design gets creative; the instructor can use VR-Forces to inject complexities into the scenario by using its advanced AI to create tactically significant behaviors in human characters or crowds. Tweak the clouds and fog, producing rain to change visibility. Increase wind and change its direction and even jam communications during runtime. As students advance through full mission training they learn to support their crewmen in complex missions. They share salient information between each other, operate radios, and communicate with ground teams, rear-area commanders and other entities covering the target area. MAK products are well suited to Sensor Operator training. 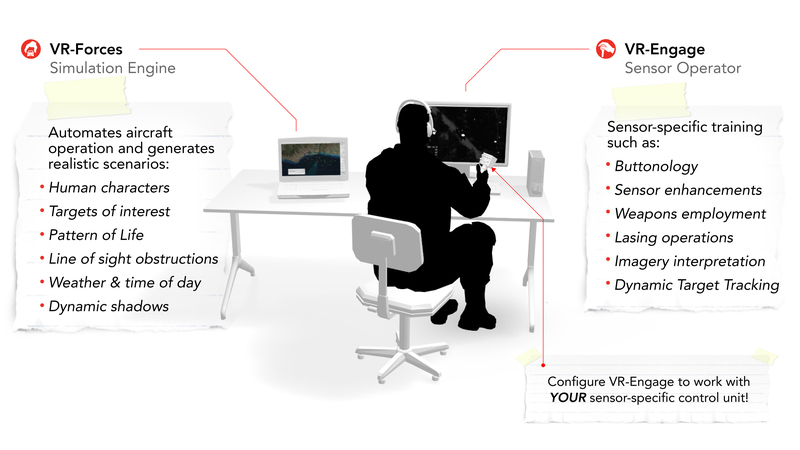 VR-Engage’s Sensor Operator role is ready to use and connect to existing training simulations, it can be configured and customized to emulate specific sensor controllers, and it can interoperate with the full capabilities of VR-Forces to form full mission trainers. MAK products can be used for live, virtual and constructive training. Get in touch and let us help you Get Ahead of the Game. MAK Software is useful in a multitude of ways to people modeling, simulating, and training ISR systems. Through a combination of longtime MAK values like interoperability and flexibility along with some new features recently added, MAK products fit whether you’re using the whole suite to model a complete simulation environment or integrating one MAK component into your system. In this info-graphic, we illustrate the multitude of ways that MAK software can contribute to a simulation that models border security scenarios. VR-Engage Sensor Operator role can be used to control a gimbaled sensor while viewing the sensor imagery feed. The vehicle/platform carrying the sensor pod can be flown interactive using the first-person VR-Engage Pilot role. VR-Forces computer generated forces AI can fly aircraft along planned routes that also respond to simulation events. Sensors can be fixed at a location such as on a building or observation tower. VR-Vantage IG renders sensor video and streams it to real (non-simulated) systems like unmanned vehicle ground stations or image processing and analysis tools. At a more abstract level, VR-Forces can model scenarios where entities detect one another and send spot reports to intelligence systems. All of these configurations benefit from MAK’s full suite of product capabilities. VR-Forces models scenarios involving vehicles, weapons, and human characters. VR-TheWorld Server provides geographic data to create the terrain databases within VR-Forces, VR-Vantage, and VR-Engage. DI-Guy SDK provides human character visualization to integrate into many commercial visual systems. MAK interoperability tools (VR-Link, MAK RTI, VR-Exchange) provide network connectivity between all the components of the ISR system. Whether you’re conducting an exercise, providing academic instruction, or managing a local crisis, simulation plays an important role in command and staff training. Simulation models the situation to provide learning opportunities for the trainees and to simulate the command and control (C2), or Mission Command systems, they use. Simulation helps trainees and instructors plan the battle or crisis, conduct the exercise, and review the outcome. MAK’s training systems have been developed in close cooperation with the US Army, Marines, and Air Force and deployed to governments across the globe. MAK CST simulates a full spectrum of operations at all levels – from squad leader through brigade commander. Whether you’re training for regular or irregular warfare, border and force protection, or civil emergency response, MAK CST provides realistic scenarios to challenge the trainees so they can hone their decision-making and communication skills. Keep reading below for more details or download our MAK CST Whitepaper. Commanders and staff officers in the field use MAK CST to practice and teach decision-making skills and processes. It works in live, constructive, or virtual simulation environments and scales from a single computer to distributed networked simulation systems with sites across the world. 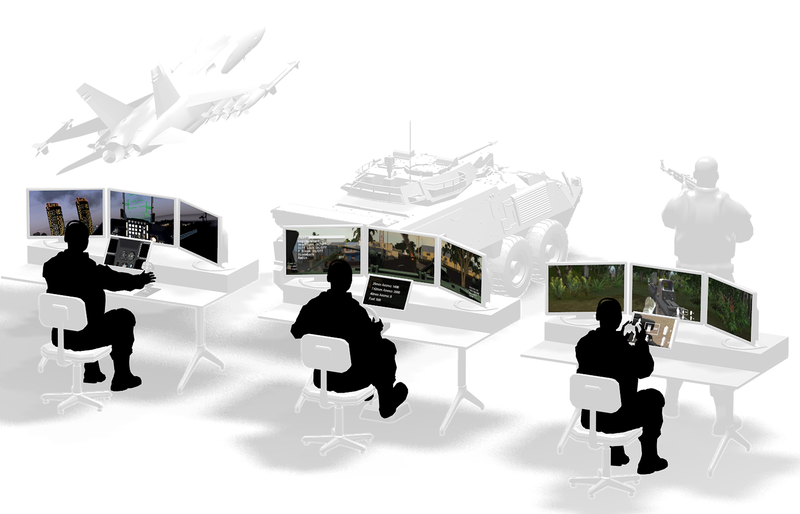 MAK CST can function in a stand-alone mode for training against computer generated enemies, while multi-player mode supports collaborative battlefield environments with multiple commanders and staff officers. It also allows multiple students in a classroom to practice individually under instructor guidance or on their own time. MAK CST accurately replicates the operational decision-making environment to create a realistic, yet easy to use “experiential learning” environment in the most cost effective way. MAK CST allows you to train for your command and control tactics, techniques, and procedures. It can provide a mock-up of a command center with simulated C2 equipment stimulated with Intel and surveillance from a contextually rich force-on-force simulation environment. It allows you to create scenarios that challenge and inform, that provide mission commanders with decision-making opportunities. It provides an environment where the entire battle staff can learn to visualize the battle-space and make tactical decisions in a time-constrained and information-rich environment. Learn more by reading through our MAK CST Whitepaper or get in touch with us! VT MAK has a long history of working with system integrators to build command and staff training systems. We can help design systems for training commanders and staff at the brigade, battalion, and company levels using aggregate level simulation, entity level simulation, and individual human character simulation. Our technology and support services enable you to deliver effective training solutions for your customers. Have a look at a few of the CST systems that MAK has helped stimulate with constructive simulation. Use MAK’s COTS products and standard support to develop your own CST solution. Our products will reduce cost, time, and risk on your project and provide a solid foundation for the creation of a CST system. Many customers use MAK’s products out-of-the-box to meet their CST requirements. However, our open toolkits allow you to add your own content, modify the software as required, and continue to maintain and enhance the system going forward. Purchase additional MAK services such as customized software, training, and on-site integration support. We are experts in system design, simulation networking via HLA and DIS, interfacing to operational C2 systems, developing customized user interfaces, and adding user specific simulation content. Contract MAK to deliver a complete turnkey solution based on your customer’s specific requirements. Read the battle tested use cases below. Our training systems can be run stand-alone or connected to operational Command and Control Systems. Our simulation technology natively uses HLA/DIS to interoperate with embedded and remote simulation systems, as well as live training systems. We embrace modern IT architectures including thin-clients, web delivery, cloud distribution of data, and mobile devices. This Shipboard Weapons Training System immerses trainees within a virtual environment. Students learn to operate the weapons along with team communication and coordination. Related Use Case - French Navy's ship defence simulators create an immersive environment allowing personnel to train and practice shipboard defence against any kind of threat. Shipboard weapons training systems focus on developing coordination and firing skills amongst a gunnery unit at sea. When it comes to appropriate levels of fidelity, it is important to develop a system that replicates the firing process, accurately renders weapon effects, and instills the environmental accuracy of operating on a ship in motion. In addition, the training system must stimulate the unit with appropriate threats. VT MAK’s off-the-shelf-technologies transform this system into a realistic simulation environment, providing an ideal training ground for a large variety of training skills and learning objectives. Choosing MAK for your simulation infrastructure gives you state of the art technology and the renowned ‘engineer down the hall’ technical support that has been the foundation of MAK’s culture since its beginnings. Game/Simulator Quality Graphics and Rendering Techniques take advantage of the increasing power of NVIDIA graphics cards, yielding stunning views of the ocean, the sky, the content between in between. Built in Support for Multi-Channel Rendering. Depending on system design choices for performance and number of computers deployed, VR-Vantage can render multiple channels from a single graphics processor (GPU) or can render channels on separate computers using Remote Display Engines attached to a master IG channel. 3D Content to Represent many vehicle types, human characters, weapon systems, and destroyable buildings. Visual effects are provided for weapons engagements including particle systems for signal smoke, weapon fire, detonations, fire, and smoke. Terrain Agility supports most of the terrain strategies commonly used in the modeling, simulation & training industry. Environmental effects are modeled to render with realism. Proper lighting — day or night, the effects of shadows, atmospheric and water effects including dynamic oceans (tidal, swell size and direction, transparency, reflection, etc.) Add multiple cloud layers, wind, rain, snow, even trees and grass that move naturally with the variations of wind. Sensor Modeling the look and feel of the UAV sensor feed. Sensors can be controlled by a participant or given an artificial intelligence plan. Add SensorFX to model physically accurate views from a UAV's sensor, accounting to environmental variations, such as fog, due, snow, rain, and many other factors that influence temperature and visibility. To see how its done, Click here. Radio and voice communications over DIS and HLA using Link products. Sensors, weapons, countermeasures, and behavior models for air-to-air, air-to-ground, on-the-ground, and person-to-person engagements. Standard navigation displays and multi-function display (MFD) navigation chart. Terrain agility. As with VR-Vantage IG and VR-Forces, you can use the terrain you have or take advantage of innovative streaming and procedural terrain techniques. VR-Forces is a powerful, scalable, flexible, and easy-to-use computer generated forces (CGF) simulation system used as the basis of Threat Generators and Instructor Operator Stations (IOS). VR-Forces provides the flexibility to fit a large variety of architectures right out-of-the-box or to be completely customized to meet specific requirements. VR-Engage lets the instructor choose when to play the role of a first person human character; a vehicle driver, gunner or commander; or the pilot of an airplane or helicopter. The instructor takes interactive control of the jet in real-time, engaging with other entities using input devices. This adds the human touch for a higher behavioral fidelity when needed. Scenario Definition that enables instructors to create, execute, and distribute simulation scenarios. Using its intuitive interfaces, they can build scenarios that scale from just a few individuals in close quarters to large multi-echelon simulations covering the entire theater of operations. The user interface can be used as-is or customized for a training specific look and feel. Simulating objects behavior and interactions with the environment and other simulation objects. These behaviors give VR-Forces simulation objects a level of autonomy to react to the rest of the simulation on their own. This saves you from having to script their behavior in detail. It's easy to set up and preserve your workspace, override default behaviors, and modify simulation object models. Simulation objects have many parameters that affect their behavior. Training Exercise Management, allowing the instructor to manipulate all entities in real-time while the training is ongoing. Artificial Intelligence (AI) control, where entities are given tasks to execute missions, like attack plans that trigger when the ship reaches a certain waypoint.. While on their mission reactive tasks deal with contingencies and the CGF AI plays out the mission. 2D & 3D Viewing Control that allows the instructor to switch and save their prefered point of views in real time. High-fidelity weapons interactions components are plugged in for accurate measures in real-time. Want to learn about trade-offs in fidelity? See The Tech-Savvy Guide to Virtual Simulation? Air Mission Operations Training Centers are large systems focused on training aircraft pilots and the teams of people neede to conduct air missions. To make the simulation environment valid for training, simulators are needed to fill the virtual world with mission support units, opposing forces & threats, and civilian patterns of life. Depending on the specifics of each training exercise, the fidelity of each simulation can range from completely autonomous computer generated forces, to desktop role player stations, to fully immersive training simulators. Scroll down to watch video on how VT MAK’s simulation technology fits into an air missions operations training center. Click in the bottom corner of the video for volume control and full screen viewing. MAK technologies can be deployed in many places within an air missions operations training center. VT MAK provides a powerful and flexible computer generated forces simulation, VR-Forces. Used to manage air, land, and sea missions, as well as civilians activity. It can be the ‘one CGF’ for all operational domains. Desktop role players and targeted fidelity simulators are used where human players are needed to increase fidelity and represent tactically precise decision making and behavior. Remote simulation centers connect over long-haul networks to participate when specific trials need the fidelity of those high-value simulation assets. MAK offers an interoperability solution that facilitates a common extensible simulation architecture based on international standards. VR-Link helps developers build DIS & HLA into their simulations. VR-Exchange connects simulations even when they use differing protocols. The MAK RTI provides the high-performance infrastructure for HLA networking. Local simulators, based on MAK’s VR-Engage, take the place of remote simulations — when connecting to remote facilities is not needed. VR-Engage lets users play the role of a first person human character; a vehicle driver, gunner or commander; or the pilot of an airplane or helicopter. VR-Engage can be used for role player stations. Or used as the basis for targeted fidelity or high-fidelity simulators. MAK products are meant to be used in complex simulation environments — interoperating with simulations built by customers and other vendors. However, big efficiencies are gained by choosing MAK products as the core of your simulation environment. Working on the flight deck of an aircraft carrier is dangerous business. Especially if your job is in “the bucket” and you’re supposed to release the catapult to accelerate a jet down the deck to aid its take off. You need to set the tension on the catapult after you get the weight from the refueling crew, you need to get the thumbs up from the deck chief, and finally make sure that the pilot is focused on the runway and ready. If you let that catapult go too soon, its going to hurt – a lot. VT MAK has the tools you need to develop a training system to teach flight deck safety procedures. 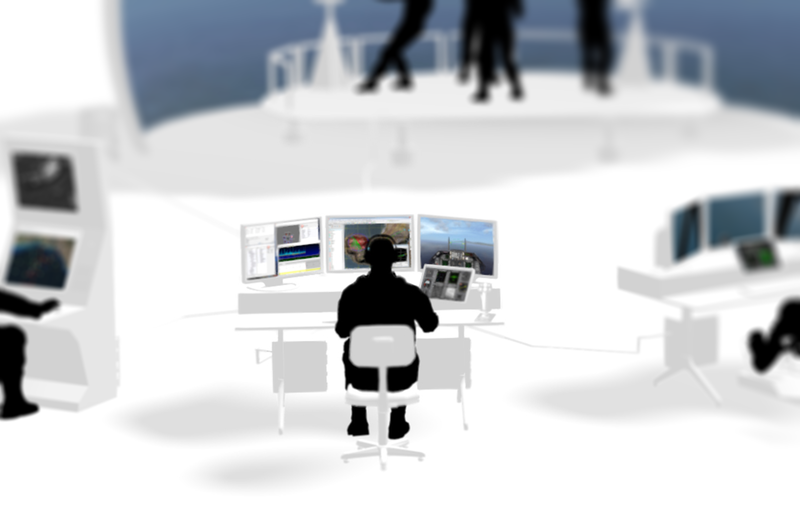 DI-Guy Scenario can create human character performances that model the activities on the flight deck. With the DI-Guy SDK, you can integrate the performances into your image generator, or you can use VR-Vantage IG, which has DI-Guy built in. If you need special gestures to meet your training requirements, you can use the DI-Guy Motion Editor to customize the thousands of character apearances that come with all DI-Guy products. Or you can create characters from motion capture files. If your training requires the detail of specific facial expression, then DI-Guy Expressive Faces will plug right in and give the you the control you need. And if you’d like help pulling this all together. MAK is here to help. With renowned product support and custom services to ensure your training system is a success. Complex training systems typically require similarly complex software and hardware configurations. MAK’s technology breaks with that sentiment, by making it easy to put together amazing training systems with simple system architectures. In this case, four different training setups are brought to life at appropriate fidelities for each player, all in one streamlined package, to yield a comprehensive Mechanized Infantry Trainer. VR-Vantage provides trainees with high-detail role-specific visual scenes, including scenes with high-fidelity data overlays. VR-Vantage emulates exterior camera views and 2D maps for the driver and commander, and a scope for the gunner with accurate data displays. Instructors use VR-Vantage to observe the exercise from a third-person perspective and evaluate trainees. VR-Vantage can be customized to match performance and resolution needs, and is used on a range of hardware, from lightweight laptops to complex motion-platform simulators. For instructors looking to control the simulation and incorporate computer-generated forces, VR-Forces is the perfect pairing for VR-Vantage. VR-Forces is a scalable simulation engine that allows instructors to populate the scene with friendly forces, hostile units, civilians, and obstacles. Instructors use VR-Forces to move units around the scene, setting up scenarios or altering a live situation in real time. With MAK you have choices on how to create a host vehicle simulation. For ground vehicles we’ve found Vortex, by CM Labs, to be an excellent vehicle dynamics solution. Vortex's contact dynamics simulate all the moving parts of the vehicle including the interaction with the terrain, water, obstacles, vision systems, grasping, and more. Everything from suspension travel to traction and gearing is accounted for to provide the driver with an enriching, engaging training scenario. RT Dynamics provides the flight dynamics for air vehicles, increasing realism for all maneuvers with physics-based aircraft entities. It also adds new maneuvers such as formation flight, terrain following flight, and vertical take off/landing. VR-TheWorld Server is a powerful web-based streaming terrain server that lets you stream in elevation, features, and imagery. It streams the terrain database to each station, giving users a synthetic environment within which to simulate. Both VR-Forces and VR-Vantage include MAK’s networking technology. VR-Link’s protocol independent API allows both applications to communicate through industry standard High Level Architecture (HLA) and the Distributed Interactive Simulation (DIS) protocols, including HLA 1.3, HLA 1516, HLA Evolved, DIS, and DIS 7. The MAK Data Logger records and plays back all the network simulation traffic for after action review and analysis. The MAK RTI (runtime infrastructure) is available when connecting to HLA federations using any of these SISO standard protocols: HLA 1.3, HLA 1516, and HLA Evolved. Want to learn more? Have a look at the VR-Vantage page for more information. Interested in seeing a demonstration? As part of a Tactical Air Control Party (TACP), only the Joint Terminal Air Controller (JTAC) is authorized to say CLEARED HOT on the radio and direct aircraft to deliver their ordnance on a target. JTACs are relied on to direct and coordinate close air support missions, advise commanders on matters pertaining to air support, and observe and report the results of strikes. Their ability to communicate effectively with pilots, and coordinate accurate air strikes can play a huge role in the success of a mission. Virtual training systems allow JTACs to practice identifying targets, calibrating their locations, requesting air support, and the highly-specialized procedures for communicating with pilots. Scroll down to watch video on how VT MAK’s simulation technology comes together to make up a JTAC simulator. The JTAC simulator in this use case takes advantage of simulations built on MAK’s core technologies. The tight coupling of system components provides a rich simulation environment for each participant. The JTAC simulation is rendered in the dome using VR-Vantage; the flight simulation takes advantage of the VR-Forces first-person simulation engine; and the instructor/role player station uses VR-Forces CGF to populate the synthetic environment and control the training scenarios. All these system components share a common terrain database and are connected together using VR-Link and the MAK RTI, giving the system integrator the ability to deploy reliably and cost effectively while leaving open the opportunity to expand the system to add bigger and more complex networks of live, virtual and/or constructive simulations. VR-Vantage uses the most modern image rendering and shader techniques to take advantage of the increasing power of NVIDIA graphics cards. VT MAK's Image Generator has real-time visual effects to rival any modern IG or game engine. Support for multi-channel rendering is built in. Depending on system design choices for performance and number of computers deployed, VR-Vantage can render multiple channels from a single graphics processor (GPU) or can render channels on separate computers using Remote Display Engines attached to a master IG channel. VR-Vantage is loaded with content including 3D models of all vehicle types, human characters, weapon systems, and destroyable buildings. Visual effects are provided for weapons engagements including particle systems for signal smoke, weapon fire, detonations, fire, and smoke. All MAK’s simulation and visualization products are designed to be terrain agile, that means that they can support most of the terrain strategies commonly used in the modeling, simulation & training industry. Look here for technical details and a list of the formats supported. VR-Vantage can render scenes of the terrain and environment with the realism of proper lighting — day or night, the effects of illuminated light sources and shadows, atmospheric and water effects including multiple cloud layers effects and dynamic oceans, trees and grass that move naturally with the wind. VR-Vantage can render scenes in all wavelengths: Night vision, infrared, and visible (as needed on a JTACs dome display). Sensor zooming, depth of field effects, and reticle overlays model the use of binoculars and laser range finders. High-fidelity physics-based aerodynamics model for accurate flight controls using game or professional level hands on throttle and stick controls (HOTAS). Standard six-pack navigation displays and multi-function display (MFD) navigation chart. 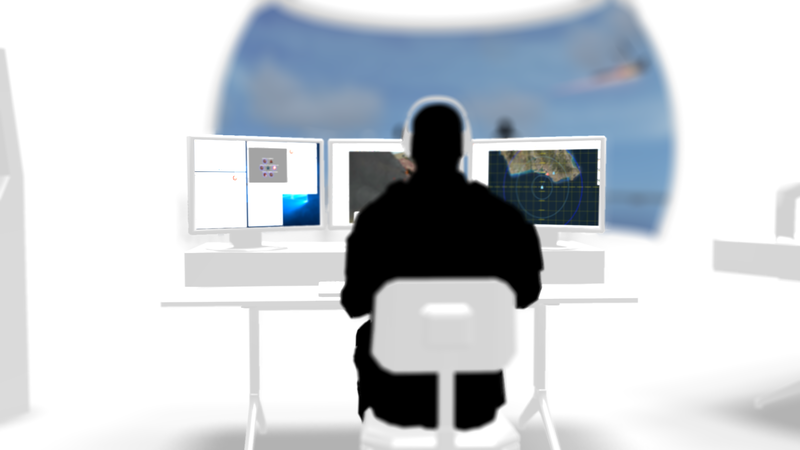 All the same VR-Vantage based IG capabilities in a flight simulator/roleplayer station as in the JTAC’s dome display. The flexibility to configure as needed: Single screen (OTW + controls + HUD), Dual screen (OTW + HUD, controls), Multi Screen OTW (using remote display engines). The flight simulator is integrated with the VR-Forces-based IOS so the instructor can initialize the combat air patrol (CAP) mission appropriately in preparation for the close air support (CAS) mission called by the JTAC. All flights are captured by the MAK Data Logger for after action review (AAR) analysis and debriefing. Radios are provided that communicate over the DIS or HLA simulation infrastructure and are recorded by the MAK Data Logger for AAR. VR-Forces is a powerful, scalable, flexible, and easy-to-use computer generated forces (CGF) simulation system used as the basis of Threat Generators and Instructor Operator Stations (IOS). VR-Forces comes with a rich set of capabilities that enable instructors to create, execute, and distribute simulation scenarios. Using its intuitive interfaces, they can build scenarios that scale from just a few individuals in close quarters to large multi-echelon simulations covering the entire theater of operations. The user interface can be used as-is or customized for a training specific look and feel. Direct control, where new entities can be created on the fly or existing entities can be moved into position, their status, rules of engagement, or tasking changed on a whim. Some call the instructor using this method a “puckster”. Artificial Intelligence (AI) control, where entities are given tasks to execute missions, like close air support (CAS), suppressive fire, or attack with guns. While on their mission reactive tasks deal with contingencies and reactive tasks deal and the CGF AI plays out the mission. In games, these are sometimes called “non-player characters”. First person control, where the instructor takes interactive control of a vehicle or human character and moves it around and engages with other entities using input devices. When creating training scenarios, the VR-Forces GUI allows instructors to quickly switch between 2D and 3D views. The 2D view provides a dynamic map display of the simulated world and is the most productive for laying down entities and tactical graphics that help to control the AI of those entities. The 3D views provide an intuitive, immersive, situational awareness and allow precise placement of simulation objects on the terrain. Users can quickly and easily switch between display modes or open a secondary window and use a different mode in each one. The U.S. Federal Aviation Administration (FAA) is embarking on an ambitious project to upgrade the nation’s air traffic management (ATM) systems. Each team under the FAA Systems Engineering 2020 (SE2020) IDIQ will need an integrated, distributed modeling and synthetic simulation environment to try out their new systems and concepts. Aircraft manufacturers will need to upgrade their aircraft engineering simulators to model the new ATM environment in order to test their equipment in realistic synthetic environments. Simulation Integration and Interoperability. The US has standardized on the High Level Architecture (HLA) protocol for interoperability and the MAK RTI is already in use as part of the AviationSimNet. We can provide general distributed simulation interoperability services, including streaming terrain ( VR-TheWorld Server, GIS Enabled Modeling & Simulation), gateways to operational systems ( VR-Exchange), simulation debugging and monitoring (HLA Traffic Analyzer). Visualization. MAK’s visual simulation solution, VR-Vantage IG, can be used to create 3D representations of the airspace from the big picture to an individual airport. VR-TheWorld can provide the central terrain storage. Simulation. VR-Forces is an easy to use CGF used to develop specific models for non-commercial aviation entities such as UAVs, fighter aircraft, rogue aircraft, people on the ground, ground vehicles, etc. In addition, as an open toolkit, VR-Forces may well be preferred in many labs over the closed ATC simulators. You are tasked with training a team of sensor payload operators to use UAVs for urban reconnaissance missions in a specific city. Upon completion of training, trainees must be able to comb an area for a target, make a positive identification, monitor behavior and interactions, radio in an airstrike, and then report on the outcome. An ineffective training environment could lead to additional costs, losing important targets, and inefficient surveillance systems. Training with a robust solution enhances homeland security human resources for a minimal product investment. As the instructor, you need to mock up a ground control station with accurate pilot/payload operator role definitions and supply that system with surveillance data from a content-rich simulation environment. You need to construct a scene that is informative, while providing trainees with opportunities to develop their instincts and test their operating procedures based on how the scenario unfolds. Each UAV must be equipped with an electro-optical camera as well as an infrared sensor mounted to a gimbal. Radio communication between the UAV operators and a central command center must be available to coordinate surveillance and call in airstrikes. Trainees need to experience the scenario through the electro-optical sensor and infrared sensor with rich, accurate data overlays to provide them with the information they need to communicate positioning and targeting effectively. Your urban environment requires crowds of people who behave in realistic ways and traverse the city in intelligent paths. When a UAV operator spots someone, they need to be able to lock onto them when they are in motion to mimic algorithmic tracking tools. The simulation needs to be adjustable in real time so that the instructor can minimize repeat behaviors and walk the team through different scenarios. Instructors also must be able to judge the effectiveness of a trainee’s technique. In this particular case, VR-Forces provides all the software you need to bring your environment to life. Watch this MAKtv episode to see how easy it is to set up. Sensor modeling is a point of strength for VR-Forces. Give your trainees a beautiful, detailed point of view of the scene through the electro-optical sensor, and provide a high-fidelity infrared sensor display when the daylight fades. VR-Forces adds accurate data overlays so that trainees can learn to quickly and accurately read and report based on that information. Instructors can visualize 3D volumetric view frustums and assess trainees’ combing strategies as well as any gaps in coverage, and engineer surveillance systems. We model sensor tracking to lock onto targets while they are in movement or on a fixed location. VR-Forces is an ideal tool for scenario development. It can model UAVs in fine detail, while allowing for instructors to customize those entities based on the scope of a mission. It’s simple to add the gimbal mounted sensor array that we need for this scenario and define parameters for - including zoom, zoom speed, slew rate, and gimbal stops. 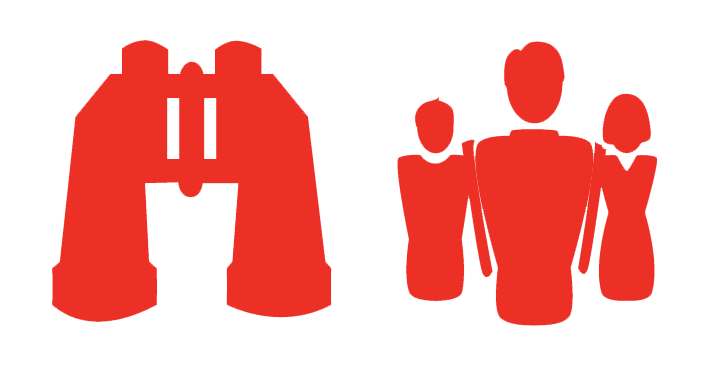 Easily populate an urban environment with people by using the group objects function to add crowds of entities at a time. VR-Forces has features from Autodesk's Gameware built in, enabling Pattern of Life intelligent flows of people and vehicles, in addition to plotting the locations and tasks of individual entities. The Pattern of Life lets you manipulate patterns within the scenario – including realistic background traffic, whether it’s people, road, or air. Certain DI-Guy capabilities have been integrated into VR-Forces, meaning behavior modeling is more authentic, thanks to motion capture technology. Now you can train your team to look out for certain suspicious movements and calibrate their responses based on the actions of the target. What really makes VR-Forces perfect for training is the ability of instructors to manipulate the scenario in real time. You can keep your trainees from running scenarios that are too predictable by having your target enter buildings, change his mode of transportation, or actively attempt to avoid detection, all during live action. Interested in Learning More? Have a look at the VR-Forces page for more information. Can we interest you in a personal demonstration. As UAS technologies become more accessible, an increase in air traffic, particularly around urban centers is inevitable. It will be essential for governments and their agencies to develop policies with regards to air traffic and its relationship with ground traffic, specifically for low-flying UASs, and particularly in emergency situations. Well-developed traffic management will maximize safe traffic speed in regular conditions and divert flows efficiently in emergency scenarios when first-responders are rushing to a scene. Poor planning may result in economic and human loss. Simulation is an ideal space to test current traffic policies under changing conditions and to research and develop new solutions. Governments and agencies need a tool that can depict an area modeled after their own and simulate air traffic within it. The tool should be capable of depicting specific types of air traffic, including planes, helicopters, and UASs, as well as airspace demarcation. 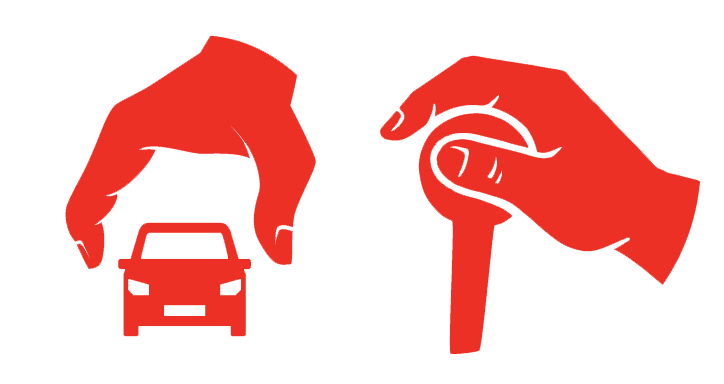 There needs to be a concurrent display of ground traffic, including pedestrians, bicyclists, and vehicles - particularly around the scene of an incident. Policymakers want to be able to visualize traffic flows and craft response strategies for general and specific situations. VT MAK offers commercial-off-the-shelf (COTS) technology to construct airspace simulations, backed by a company with an “engineer down the hall” philosophy to help organizations select and implement the most effective solution. VR-Forces provides a scalable computer-generated forces simulation engine capable of populating an environment with air and ground traffic, as well as infrastructure specific to traffic systems. There is plenty of out-of-the-box content of all shapes and sizes, from sUAS up to 747s in the air, and everything from human characters and bicyclists to fire trucks on the ground. If an out-of-the-box model needs to be modified to match local specifications, or if an agency wants to create their own from scratch, MAK’s open-source API allows for full customization of entity appearance and performance. VR-Forces depicts volumetric airspace regulations, giving policymakers a three-dimensional perspective of air corridors and restricted spaces as they swell and shrink. Crucially, volumetric airspace restrictions can be assigned to impact air and ground traffic systems accordingly. For example, if there was an auto accident, set policies could dictate an air restriction in the area up to a certain height to provide space for UAS emergency response and redirect UAS traffic as long as necessary. At the same time, traffic on the ground within a particular radius may have their speeds reduced, or lanes may be opened specifically for first responders to access the scene more readily. Policymakers can calibrate the size and rules applied to air corridors and measure the impact of these changes on the traffic patterns of the city. VR-Forces is capable of depicting traffic density as it shifts with new incidents, even assigning a color-coded density maps to better visualize areas of congestion in air and on the ground. VR-TheWorld allows policymakers to test these impacts inside any city for which they have the terrain data, through a web-based interface. This creates the most realistic testing lab for research and development projects. The homeland security, emergency response, and public safety communities face challenges similar to those dealt with in the military domain--they need to plan and train. But large scale live simulations are simply too disruptive to be conducted with regularity. Catastrophic emergencies require coordination of local and state public safety personnel, emergency management personnel, National Guard, and possibly regular military. Interoperability is a major problem. On a basic level, simulations require generic urban terrains with multi-story interior models, transportation infrastructure such as subways and airports, and the ability to simulate crowd behaviors and traffic. They may require terrains for specific urban areas or transportation infrastructure. Given the role of ubiquitous communications in the public sector, the ability to simulate communications networks (land-line, cell, data) and disruptions in them may also be important. For specialized emergency response training, the ability to simulate chemical, biological, and radiological dispersion may also be necessary. The need for simulation and training in this domain is self evident. The budgetary constraints are daunting for many agencies. The cost-effective solutions that VT MAK has developed for the defense community can provide immediate benefits to homeland security, emergency response, and public safety agencies. With VR-Link, VR-Exchange and MAK RTI: Link simulation components into simulation systems, or connect systems into world-wide interoperable distributed simulation networks. With VR-Forces: Build and Populate 3D simulation environments (a.k.a. virtual worlds), from vehicle or building interiors to urban terrain areas, to the whole planet. Then Simulate the mobility, dynamics and behavior of people and vehicles; from individual role players to large scale simulations involving 10’s of thousands of entities. With VR-Vantage IG: Visualize the simulation to understand analytical results or participate in immersive experiences. These are a few of the system components that our customers use to build their simulation systems. For each component we try to express one or more ways in which these components can be designed to fit into different system designs. And we identify where the MAK products benefit the design of each. Where does the Instructor Operator Station fit within the system architecture? Training events are becoming larger and more widely distributed across networked environments. Yet staffing for these exercises is often static, or even decreasing. Therefore, instructors and operators need IOS systems to help manage their tasks, including designing scenarios, running exercises, providing real-time guidance and feedback, and conducting AAR. Instructor Operator Stations (IOS) provide a central location from which instructors and operators can manage training simulations. An effective IOS enables seamless control of exercise start-up, execution, and After Action Review (AAR) across distributed systems. It automates many setup and execution tasks, and provides interfaces tailored to the simulation domain for tasks that are done manually. How does MAK software fit within the Instructor Operator Station? MAK has proven technologies that allow us to build and customize an IOS to meet your training system requirements. Situational Awareness – The MAK IOS includes a 2D tactical map display, a realistic 3D view, and an eXaggerated Reality (XR) 3D view. All views support scenario creation and mission planning. The 3D view provides situational awareness and an immersive experience. The 2D and XR views provide the big picture battlefield-level view and allow the instructor to monitor overall performance during the exercise. To further the instructor’s understanding of the exercise, the displays include tactical graphics such as points and roads, entity effects such as trajectory histories and attacker-target lines, and entity details such as name, heading, speed. Core technology: VR-Vantage. Analysis & After Action Review – The MAK IOS supports pre-mission briefing and AAR / debriefing. It can record exercises and play them back. The instructor can annotate key events in real-time or post exercise, assess trainee performance, and generate debrief presentations and reports. The logged data can be exported to a variety of databases and analysis tools for data mining and performance assessment. Core technology: MAK Data Logger. Open Standards Compliance –MAK IOS supports the High Level Architecture (HLA) and Distributed Interactive Simulation (DIS) protocols. Core technology: VR-Link networking toolkit. Simulated Voice Radios – Optionally Includes services to communicate with trainees using real or simulated radios, VOIP, or text chat, as appropriate for the training environment. Where does the Scenario/Threat Generator fit within the system architecture? Your job is to place a trainee or analyst in a realistic virtual environment in which they can train or experiment. It could be a hardware simulator, a battle lab, or even the actual equipment, configured for simulated input. Then you need to stimulate that environment with realistic events for the trainee to respond to. The stimulation usually comes from a scenario generator, also known as a threat generator. A scenario generator typically simulates the opposing force entities and complementary friendly force entities that the trainees need to interact with. A scenario generator should allow training staff to quickly and easily design and develop scenarios that place trainees in a realistic situation. The application should use the proper terminology and concepts for the trainees’ knowledge domain. It should be flexible enough to handle the entire spectrum of simulation needs. The entities simulated by the scenario generator should be able to operate with enough autonomy that once the simulation starts they do not need constant attention by an instructor / operator, but could be managed dynamically if necessary. In addition to its basic capabilities, a scenario generator needs to be able to communicate with the simulator and other exercise participants using standard simulation protocols. It needs to be able to load the terrain databases and entity models that you need without forcing you to use some narrowly defined or proprietary set of formats. Finally, a scenario generator needs to work well with the visualization and data logging tools that are often used in simulation settings. How does MAK software fit within the Scenario/Threat generator? Situational Awareness – The visualization system includes a 2D tactical map display, a realistic 3D view, and an eXaggerated Reality (XR) 3D view. All views support scenario creation and mission planning. The 3D view provides situational awareness and an immersive experience. The 2D and XR views provide the big picture battlefield-level view and allows the instructor to monitor overall performance during the exercise. To further the instructor’s understanding of the exercise, the displays include tactical graphics such as points and roads, entity effects such as trajectory histories and attacker-target lines, and entity details such as name, heading, speed. Core technology: VR-Vantage. Network modeling – The lab can simulate communications networks and the difficulties of real-world communications. Core technologies: Qualnet eXata and AGI SMART. Correlated Terrain – VT MAK’s approach to terrain, terrain agility, ensures that you can use the terrain formats you need, when you need them. We can also help you develop custom terrains and can integrate them with correlated terrain solutions to ensure interoperability with other exercise participants. Core technologies: VR-TheWorld Server, VR-inTerra. Sensor modeling – The visualization component can model visuals through different sensor spectrums, such as infrared and night vision. Core technology: JRM SensorFX. Open Standards Compliance – VR-Forces supports the High Level Architecture (HLA), Distributed Interactive Simulation (DIS). Using the new Sensor Operator capability, a VR-Engage user can perform common surveillance and reconnaissance tasks such as tracking fixed and moving targets - using a simulated E/O camera or IR sensor, with configurable informational overlays. Immediately control the gimbaled sensor using joysticks or gamepads; or configure VR-Engage to work with sensor-specific hand controller devices. VR-Engage has built-in support for HLA/DIS radios, allowing sensor operators to communicate with pilots, ground personnel, or other trainees or role players using standard headsets. Attach a gimbaled sensor to any DIS or HLA entity, such as a UAV, ship, or manned aircraft - even if the entity itself is simulated by an existing 3rd party application. When VR-Engage is used in conjunction with VR-Forces CGF, a role player can take manual control of a camera or sensor that has been configured on a VR-Forces entity. For a full UAV Ground Control Station, use VR-Forces GUI to "pilot" the aircraft by assigning waypoints, routes, and missions; while using VR-Engage's Sensor Operator capability to control and view the sensor on a second screen. 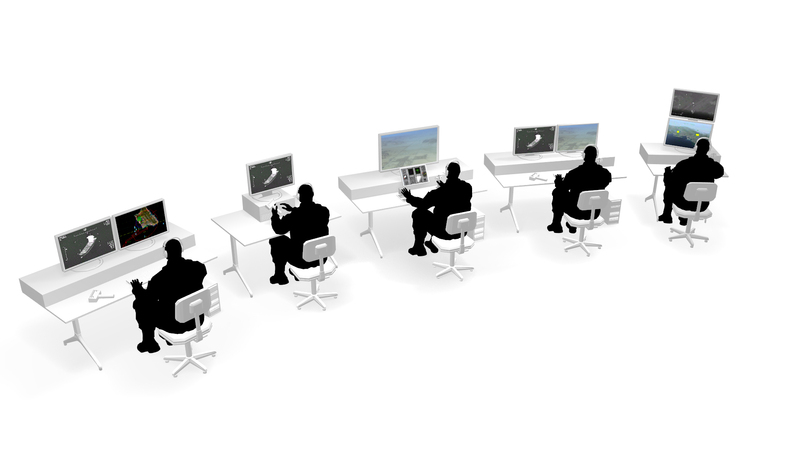 Execute a multi-crew aircraft simulation using two copies of VR-Engage - one for the pilot to fly the aircraft using a standard HOTAS device or gamepad; and a second for the Sensor Operator. Place fixed or user-controllable remote cameras directly onto the terrain, and stream the resulting simulated video into real security applications or command and control systems using open standards like H.264 or MPEG4. VR-Engage comes with MAK's built-in CameraFX module which allows you to control blur, noise, gain, color, and many other camera or sensor post-processing effects. The optional SensorFX add-on can be used to increase the fidelity of an IR scene - SensorFX models the physics of light and its response to various materials and the environment, as well as the dynamic thermal response of engines, wheels, smokestacks, and more. Where do Virtual Simulators fit within the system architecture? Virtual simulators are used for many different roles within Training, Experimentation, and R&D systems. Trainees – The primary interface for training vehicle and weapons operations, techniques, tactics, and procedures, is often a Virtual Simulator. Pilots use flight simulators, ground forces us driving and gunnery trainers, soldiers use First Person Shooter simulators, etc. 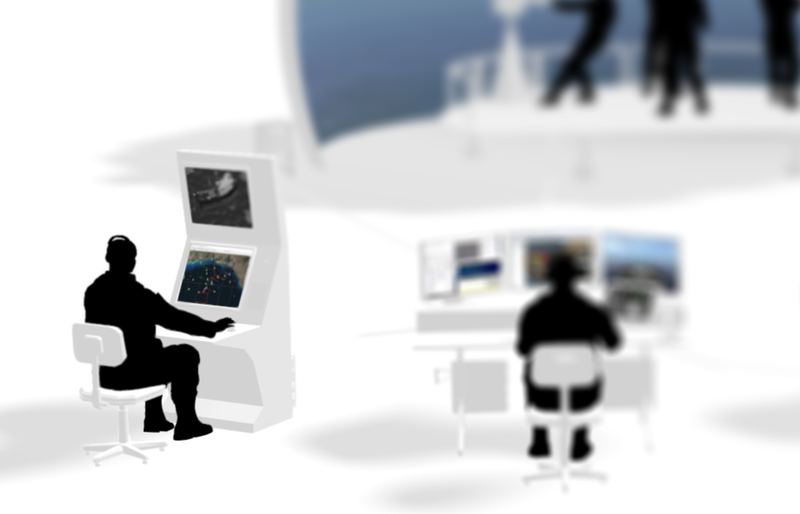 Test Subjects – Virtual Simulators are used to test and evaluate virtual prototypes, to study system designs, or analysing behavior of operators. 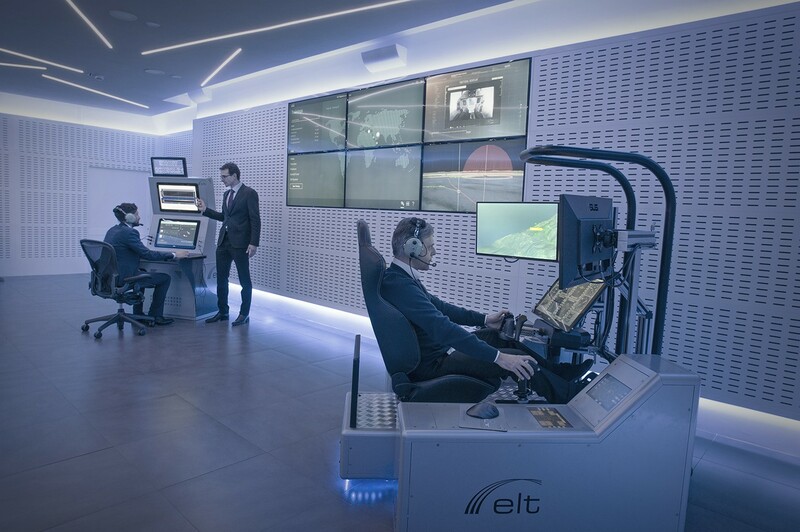 In either case, the Virtual Simulator is connected to other simulators, instructor operator stations, and analysis tools using a distributed simulation network. Collectively these systems present a rich synthetic environment for the benefit of the trainee or researcher. Role Players – Scenario Generators, Computer Generated Forces, Threat Generators, or any other form of artificial intelligence (AI) can add entitites to bring the simulated environment to life. But, as good as AI can be, some exercises need real people to control supporting entities to make the training or analysis accurate. In these cases Virtual Simulators can be used to add entities into the scenarios. The fidelity of Virtual Simulators can vary widely to support the objectives within available budgets. The following slideshow is from the The Tech Savvy Guide to Virtual Simulation, which goes into great detail about the fidelity of Virtual Simulators. Download the Tech Savvy Guide here. How does MAK software fit within a Virtual Simulator? Multi-role Virtual Simulator – MAK's VR-Engage is a great place to start. We've done the work of integrating high-fidelity vehicle physics, sensors, weapons, first-person controls, and high performance game-quality graphics. VR-Engage lets users play the role of a first person human character; a vehicle driver, gunner or commander; or the pilot of an airplane or helicopter. Use it as is, or customize it to the specifications of your training or experimentation. As with VR-Vantage and VR-Forces, VR-Engage is terrain agile so you can use the terrain you have or take advantage of innovative streaming and procedural terrain techniques. VR-Engage can run standalone - without requiring any other MAK products and is fully interoperable with 3rd party CGFs and other simulators through open standards. But many additional benefits apply when VR-Engage is used together with MAK’s VR-Forces – Immediately share and reuse existing terrain, models, configurations, and other content across VR-Forces, VR-Vantage, and VR-Engage - with full correlation; Unified scenario authoring and management; and run-time switching between player-control and AI control of an entity. Visual System – If you have your own vehicle simulation and need immersive 3D graphics, then VR-Vantage IG is the tool of choice for high-performance visual scenes for out-the-window visuals, sensor channels, and simulated UAS video feeds. VR-Vantage can be controlled through the Computer Image Generator Interface (CIGI) standard as well as the High Level Architecture (HLA) and Distributed Interactive Simulation (DIS) protocols. SAR Simulation – If your simulator is all set, but you need to simulate and send Synthetic Aperture Radar images to the cockpit, then RadarFX SAR Server, can generate realistic SAR and ISAR scenes and send them over the network for you to integrate into your cockpit displays. Network Interoperability – Developers who build the Virtual Simulator from scratch can take advantage of VR‑Link and the MAK RTI to connect the simulation to the network for interoperation with other simulation applications using the High Level Architecture (HLA), and Distributed Interactive Simulation (DIS) protocols. Where does an Image Generator fit within the system architecture? Image generators provide visual scenes of the simulation environment from the perspective of the participants. These can be displayed on hardware as simple as a desktop monitor, or as complex as a multiple projector dome display. The scenes can be rendered in the visible spectrum for "out-the-window" views or in other wavelengths to simulate optical sensors. In any case, the Image generator must generate scenes very quickly to maintain a realistic sense of motion. This slideshow is from the Image Generation section of The Tech Savvy Guide to Virtual Simulation, which goes into great detail about the Image Generator and other components of a simulation system. Download the Tech Savvy Guide here. How does MAK software fit within an Image Generator? VR-Vantage is the core of MAK Image Generation solution. It uses best of breed technologies to custom tailor high quality visual scenes of the synthetic environment for your specific simulation needs. VR-Vantage IG can be used as a standalone Image generator, connected to a host simulation via CIGI, DIS, or HLA protocols. VR-Vantage is also used as the rendering engine for all MAKs graphic applications, including VR-Engage (multi-role virtual simulator), VR-Forces (Computer generated forces), and VR-Vantage Stealth (battlefield visualization). Multi-channel distributed rendering – VR-Vantage IG takes advantage of the power of the latest NVIDIA graphics processing units (GPU) to render to one, or more, displays per computer. When very large fields of view are needed, VR-Vantage can be setup to distribute the rendering task across multiple computers each running the VR-Vantage Display Engine. When tight frame synchronization is needed between channels, VR-Vantage can support NVIDIA's professional graphics cards that perform hardware synchronization to an external synchronization source (also known as G-Sync). Distortion Correction – When rendering to complex surface shapes, like those used to surround a cockpit with "out-the-window" video, VR-Vantage IG includes a plugin made by Scalable Display Technologies that warps the image to match the shape of the display surface. High Fidelity Sensor Visualization – VR-Vantage IG can, optionally, be configured with SensorFX to convert the visual scene into an accurately rendered sensor scene to simulate night vision goggles, infra-red, and other optical wavelengths. Correlated Terrain – VT MAK’s approach to terrain – terrain agility – ensures that you can use the terrain formats you need, when you need them. VR-Vantage, VR-engage, and VR-Forces all support many of the terrain technologies used throughout the industry. We can also help you develop custom terrains and integrate them with correlated terrain solutions to ensure interoperability with other exercise participants. Open Standards Compliance –VR-Vantage supports the Computer Image Generator Interface (CIGI) standard as well as the High Level Architecture (HLA) and Distributed Interactive Simulation (DIS) protocols. Where does Unmanned Vehicle System (UVS) Simulation fit within the system architecture? 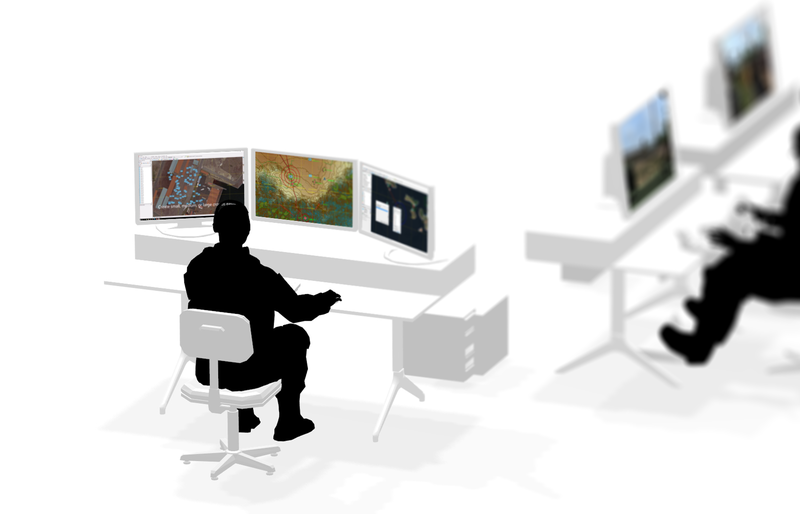 Since Unmanned Vehicles are by their nature controlled remotely, simulations systems can be designed and built to closely model the actual control stations used in live operation. An Unmanned Vehicle System (UVS), also known as Remotely Piloted Vehicle (RPV), can run as a stand-alone system or be integrated with or embedded into a UVS simulator or ground control station. Demonstration – Visualization of new designs helps to confirm their value. UVS systems help to demonstrate new vehicle designs or concepts within a synthetic environment. Experimentation – Simulations help prove and refine new concepts or Tactics, Techniques, and Procedures (TTPs). Simulated UVSs are used in complex scenarios as part of realistic simulations that are linked to real systems, hardware, and other human-in-the-loop simulators. Research & Development – Unmanned Vehicle System simulations can be used to test guidance, navigation, and control functions of a new or modified UVS without the risk of harming people or property that is inherent in live testing. UVS simulations can provide realistic avionics models, sensor models, and visuals, and emulate real-world controls and communication systems. Training – Simulations allow pilots, sensor/payload operators, mission commanders, and visual intelligence analysts to train, practice, and analyze decision-making and communication processes. How does MAK software fit within Unmanned Vehicle System (UVS) Simulation? Control Station – VR-Forces can form the basis of the UVS control station by providing 2D tactical map displays for operator planning and simulated remote operation of the vehicle. Vehicle Simulation – VR-Forces can also be the simulation platform for the unmanned vehicle, either by treating the vehicle as a standard Computer Generated Forces (CGF) entity or by plugging 3-rd party modules with higher fidelity vehicle dynamics models. Developers can also extend VR-Forces to use their own vehicle dynamics and control system models. 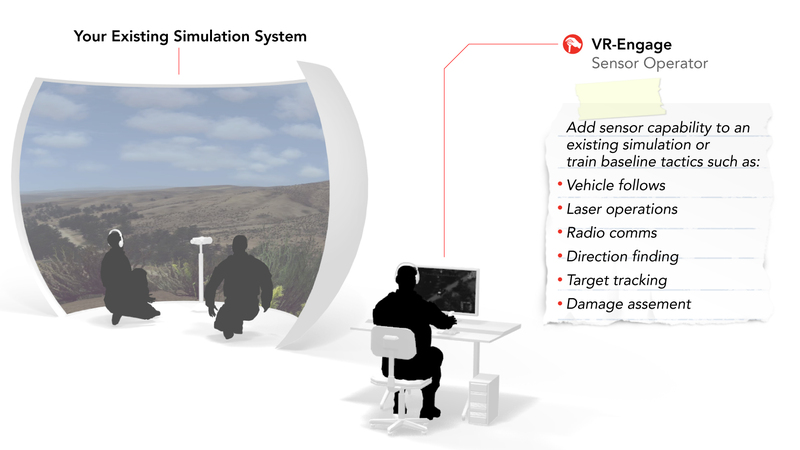 Scenario Generation – Regardless of how the unmanned vehicle is simulated, VR-Forces can provide a powerful and easy to use scenario generation capability to create operationally relevant scenarios. Sensor Simulation – VR-Vantage IG and SensorFX provide realistic and accurate 3D perspective scenes to model electro-optical (EO), night vision (NV), or infrared (IR) sensors. Networking – Developers who build the UAV simulation from scratch can take advantage of VR-Link and the MAK RTI to connect the simulation to the network for interoperation with other simulation applications using the High Level Architecture (HLA), and Distributed Interactive Simulation (DIS) protocols. Where does the AAR/Debrief component fit within the system architecture? After Action Review (AAR) systems provide feedback on mission and task performance during training exercises. AAR is a critical part of the training process – it is a structured review, or debrief, for analyzing what happened during an exercise and why it happened. By comparing the actual events with the expected outcomes, instructors and students can identify strengths and weaknesses and decide how to improve performance. As training exercises become larger, the need becomes greater for automated tools that capture the actions of all training participants, evaluate performance against standard metrics, and provide the information necessary to support a structure debrief of the training event. These tools should be flexible enough to support chronological reviews of an entire exercise or tightly focused reviews highlighting a few key issues. How does MAK software fit within the AAR/Debrief component? Simulation Recording and Playback – Simulation data can be recorded and played back using the MAK Data Logger. This includes simulated entities and interactions, audio communications, video streams, and other events injected into the simulation. The Data Logger user can pause, slow-down, or speed-up the playback, and can jump to specific moments during the exercise via a simple, easy-to-use, DVR-like control panel. Annotation – The embedded annotation system enables instructors to bookmark key events during the action and then jump to those events during playback to review specific actions. 2D map and 3D out-the-window visualization – The VR-Vantage Stealth provides 2D tactical map displays for situational awareness; and 3D 'god's eye views' create immersive scenes of the simulated environment from the perspective of any trainee. An exaggerated reality mode combines the best of 2D & 3D techniques into a compelling visual analysis of the training exercise. Analytical Information – Users can track a specific trainee or groups of trainees and view the scene from various perspectives. Informational overlays including trajectory histories, unit status, attacker-target lines, and other tactical graphics further aid in understanding the training scenario as it plays out. Data Mining - The recorded training events can be exported to standard database and spreadsheet applications, which can be used for data mining, in-depth analysis, and charting or graphing of specific datasets. Distributed Interactive Simulation (DIS) protocols. Developers can use or extend VR-Link to presnet and capture simulation specific information. How does the Terrain Data Server componnet fit within the system architecture? Distributed simulation designs are constructed by combining loosely coupled and interoperable components. However, while the simulation applications are distributed, terrain data usually is not. 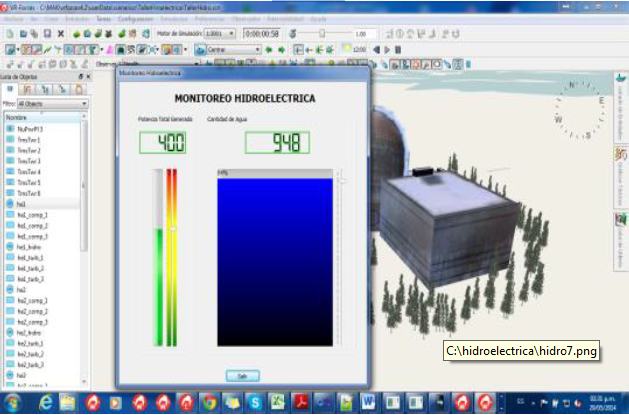 Each simulation application usually accesses terrain data stored on the local machine. This approach limits terrain interoperability and reuse. It constrains the amount of data that can be accessed to the amount that can be stored locally and necessitates redundant copying of data from one machine to another. Terrain servers solve this problem by storing large amounts of terrain data and supplying it over the network to client applications. In addition to the problem of terrain availability, simulations that aspire to high levels of realism must deal with the problem of static terrain. The world is not static. Actions of simulated objects can affect aspects of the environment and these changes need to be available to all participants. Bombs can create craters; vehicles can form berms to provide fortified positions; objects can be destroyed and produce debris. When terrain data is stored locally, there is no good way to propagate terrain changes to exercise participants. A dynamic terrain server solves this issue. Where does MAK software fit within the Terrain Data Server component? MAK's dynamic terrain server, VR-TheWorld, enables data to be accessed as a shared service that can be seamlessly and interactively viewed from anywhere, at any level, in a variety of formats. The server provides the foundation for current simulations, facilitates centralized management and future scalability, and enables dynamic terrain changes to be propagated to simulation applicationsl; it also lets you interactively stream and view on-demand data in real-time simulations. Simulation users can spin the globe, zoom into a location, drop units, and start simulating. The server supports the concept of “stateful” objects within the terrain, such as destructible buildings, doors that can be opened or breached, and trees that can fall and block movement along roads. When the state of a terrain object changes, that change is immediately available to all applications using the terrain server, allowing entities to interact appropriately. Furthermore, the terrain skin can be deformable, enabling simulation-specific changes such as craters to be seamlessly “stitched” into the terrain. All the terrain details are accessible via open standards.